Today we are exploring New York City and discovering all the tastes this vast city has to offer. 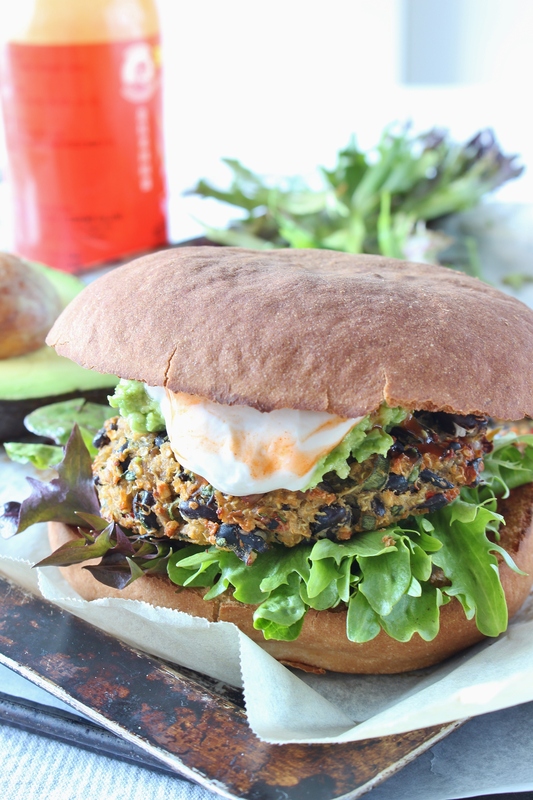 While I’m out and about, enjoy these hearty vegetarian burgers! Juicy, hearty, spicy vegetarian burgers full of flavour and topped with a cool and spicy sriracha sauce. Get out your buns and let’s get grilling! Vegetarian burgers don’t always get the best reviews. I don’t think I’ve ever eaten a commercially made vegetarian burger because they always just seem so lackluster and like they are trying to be meat. You aren’t meat, Miss Vego Burger, you are a vegetarian burger and you need to celebrate your uniqueness and embrace your true personality! Down with the burger patriarchy! Ahem. When Yum. Gluten Free Magazine contacted me to contribute to their burger issue I jumped at the chance to create a vegetarian burger that could proudly stand on it’s own two feet and declare – yes, I am a vegetarian burger and I have a lot to offer the world of flavour! I attempted to Oprah the burger. Yes, Oprah can be used as a verb. The thing with meat is that it is layered and complex and contributes lots of umami flavours by virtue of the glutamine (an essential amino acid) found in muscle. Take away the muscle, and you need to add that umami back in, and bump up all the other flavours to create a whole vegetarian burger experience that doesn’t feel like second place. So, we are bringing soy sauce into the picture to contribute umami, cumin for a deep background flavour, and sriracha and chili flakes for top level heat (reduce/omit to tone down the spice). 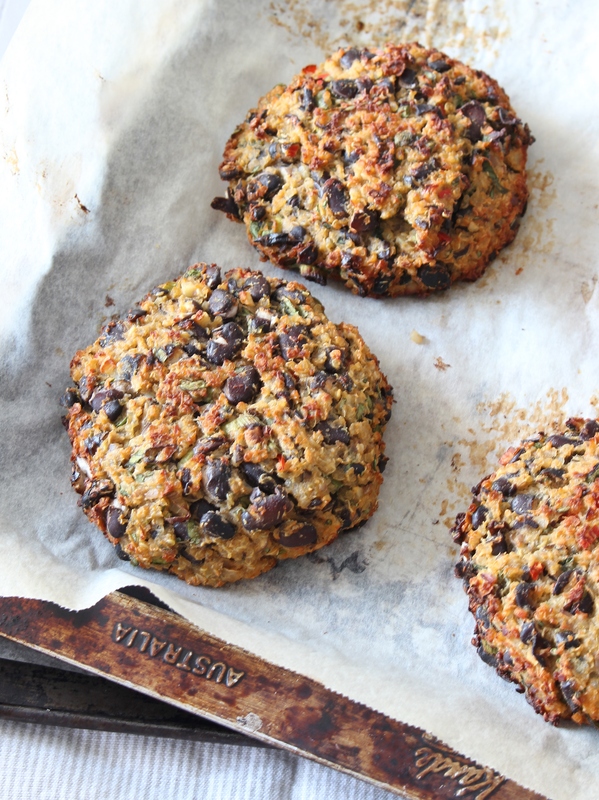 The body of these burgers is made up of black beans and quinoa. 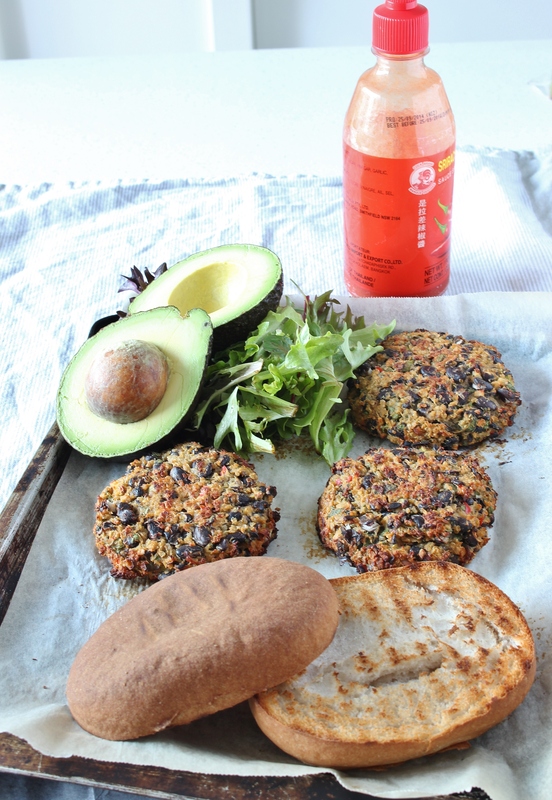 Black beans are sensationally hearty and make a wonderful base for a burger when coupled with quinoa. When you bite into my hearty, wholesome vegetarian burgers you get spicy, umami, hefty burger, creamy avocado, and spicy cool sriracha yoghurt. Every bite is full of flavour. There’s nothing weak, wimpy, or second place about these vegetarian burgers. Stand in your truth Miss Vego Burger and embrace your natural beauty. Tip: If you don’t want these burgers to be quite as spicy you can leave out the sriracha and the red chili. Place quinoa and vegetable stock in a medium size saucepan. Cover and bring to the boil. Allow quinoa to boil for 5 minutes, then turn the heat to low and simmer for 15 minutes. Remove from heat, drain thoroughly, and allow to cool to room temperature. Drain tinned black beans and rinse. Place some paper towels on a rimmed baking sheet and spread beans out to drain completely. Preheat oven to 180C (350F) and line a rimmed baking sheet with baking paper. 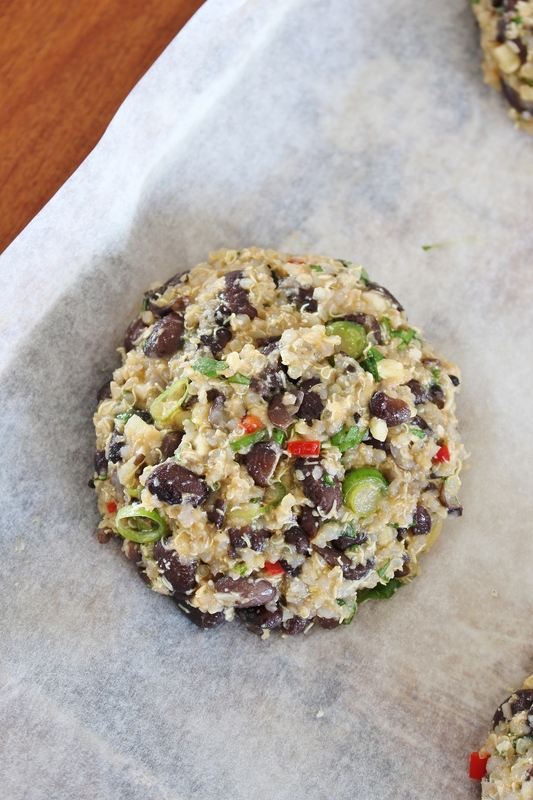 Place one cup cooled quinoa and half the drained black beans in the bowl of a food processor. Pulse until a chunky paste starts to form. Place paste into a bowl and add cumin soy sauce, sriracha, pepper, egg, onion, chilli, coriander, quinoa, and remaining beans and quinoa and mix thoroughly to combine. Form batter into four patties and press down slightly to flatten. Bake in preheated oven for 15 minutes. Then turn patties over and bake for a further 15 minutes. Mash avocado with a little salt and pepper and lime juice. Mix sriracha with Greek yoghurt. 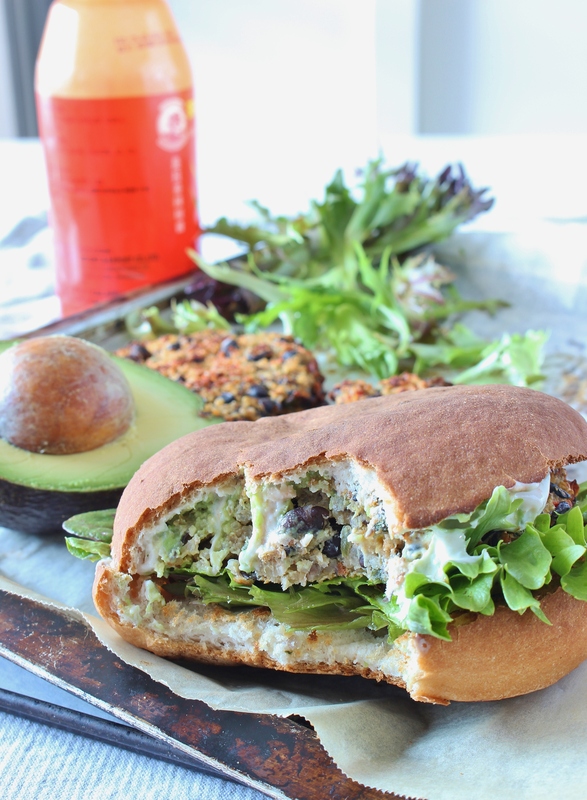 To assemble: slice buns and place lettuce on each. 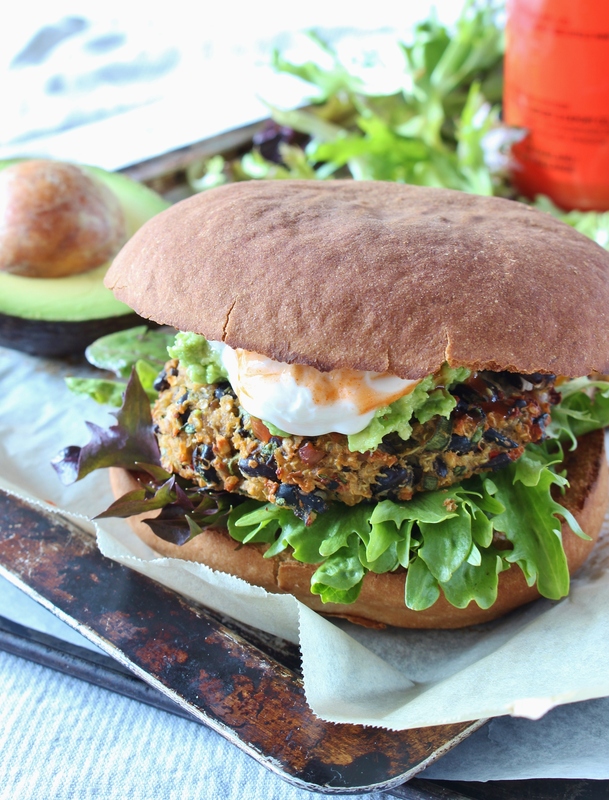 Top with a spicy black bean burger, a dollop of mashed avocado and a serving of sriracha yoghurt. 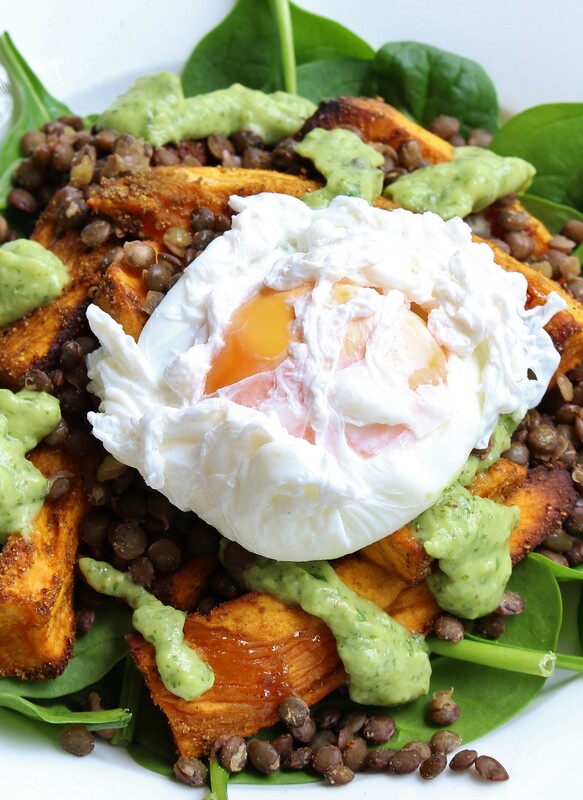 Spicy roasted sweet potatoes cosy up to puy lentils under a perfectly runny poached egg and a herbed lime and avocado sauce. This heavenly, protein rich, vegetarian bowl is perfect for lunch, dinner, or a lazy weekend brunch! Sometimes I think every meal would be better if we just ate breakfast food. I mean, avocado on toast, cereal with icy cold milk, granola parfaits, oatmeal, and poached eggs on pretty much anything, are among the best foods ever created. So, in this meal I attempt to mash together several breakfast favourites with some adult things called vegetables – and give it a decent heaping of vegetarian protein too! Let’s start from the bottom, shall we? 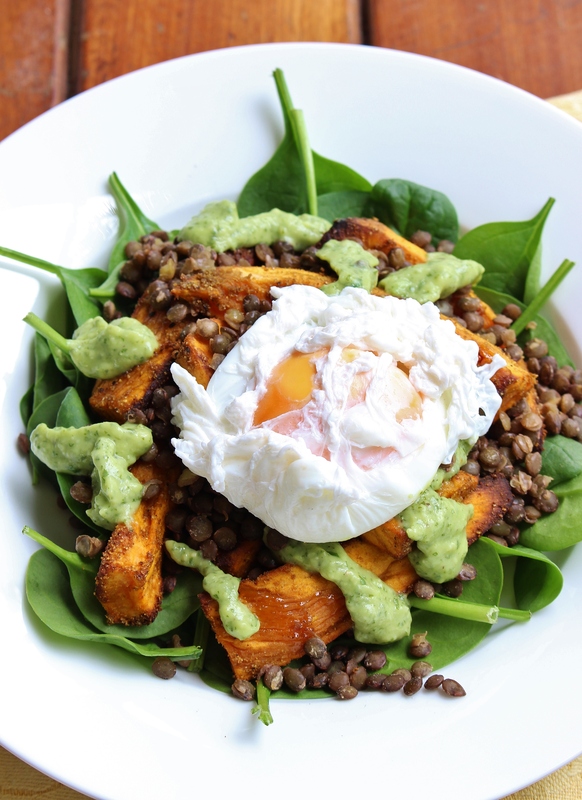 I piled some leafy greens into the bottom of my bowl because the fresh crunch of baby spinach is the perfect background to the key players in this bowl, and it picks up all the drippy egg leftovers, crispy collateral damage from the sweet potato and leftover avocado herb sauce. The next layer is our roasted sweet potatoes. These are cut thick, rolled in olive oil, cumin, and ground coriander, and then roasted until soft and sweet. 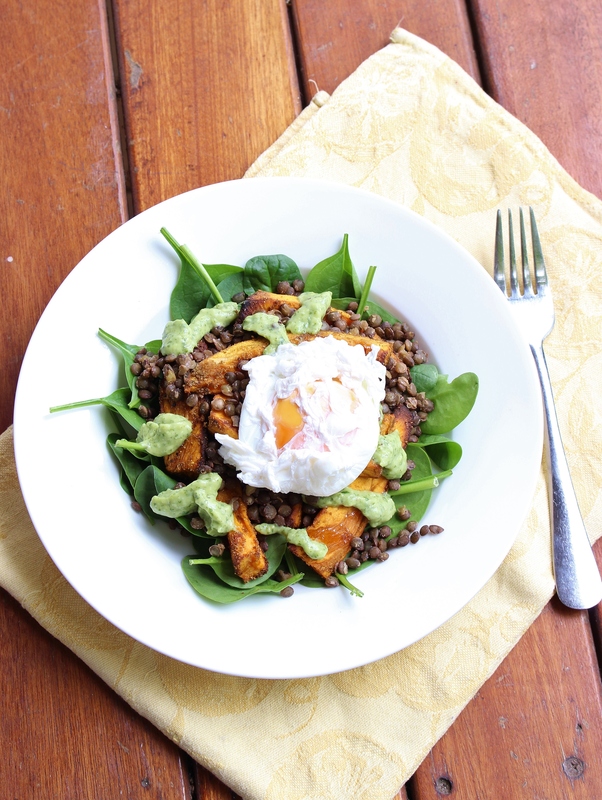 Puy lentils pack a major nutritional punch here too. Did you know just 1 cup of these babies has 18 grams of protein and over 30% of your daily requirement of iron! Take that Popeye! I cook my lentils with a few bay leaves and some dried thyme to boost their naturally earthy flavour. Now for the sauce. 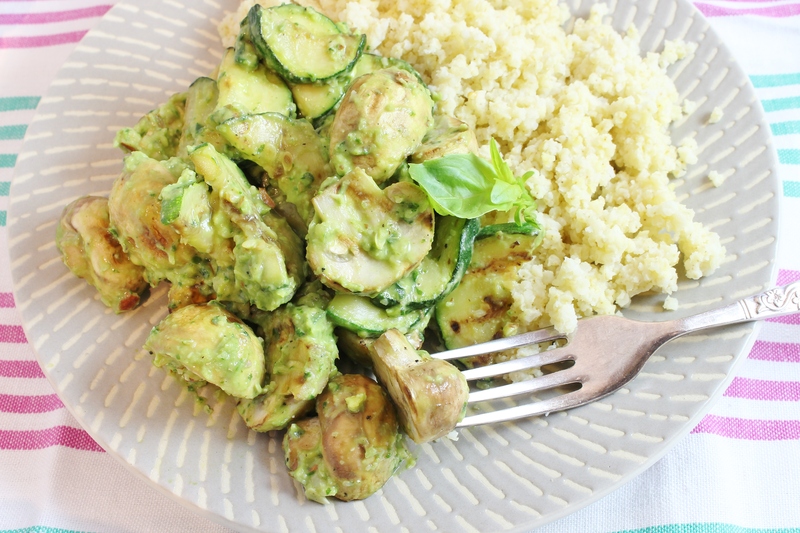 This creamy avocado sauce brings everything together. 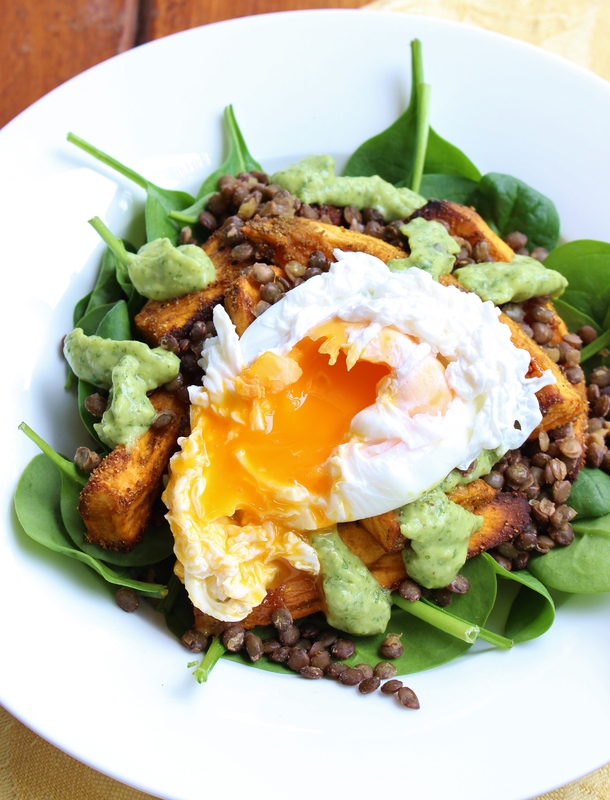 It’s tangy, and smooth, and creamy and sharp and the perfect foil to sweet potatoes and lentils and a runny, drippy-centred poached egg. I slathered the leftover sauce on everything I could find after I had finished eating this dish – crackers, roasted potatoes, quinoa salad – everything. You could even use it as a super smooth guacamole dip all by itself! Now that’s an idea for Friday night dinner 😉 And the crowning glory of this bowl is a gloriously wobbly, golden, ready-to-burst poached egg. I don’t profess to be the best poached egg maker on the planet, so I don’t have a fool-proof method. My top tips are: use really, really fresh eggs; make sure you add some white vinegar to your water (it helps coagulate the proteins); and use a tea cup to slide the eggs into the water. As per usual, Jamie Oliver does a great job of teaching us how to do it and gives three different ways to achieve poached egg perfection. Transport yourself to the best little bistro ever and make this in your own kitchen today! Preheat your oven to 200C and line a large baking tray with baking paper. Peel sweet potato and chop into long finger-sized pieces. Place on baking sheet. Drizzle over olive oil, and sprinkle on coriander and cumin. Use clean hands to mix it all together so that the sweet potato pieces are all coated in the oil and spice mixture. Bake sweet potatoes in the pre-heated oven for 25 minutes or until soft in the middle when poked with a fork. While potatoes are baking, cook your lentils. Rinse lentils well and place in a medium saucepan with 2 cups of cool water and the bay leaves and dried thyme. Bring water to the boil, then reduce to a simmer and cook for 20 minutes or until the lentils are al dente: firm but cooked all the way through. Once the lentils are cooked, drain well and set aside until needed. While the lentils are cooking and the potatoes are baking, make the avocado sauce. 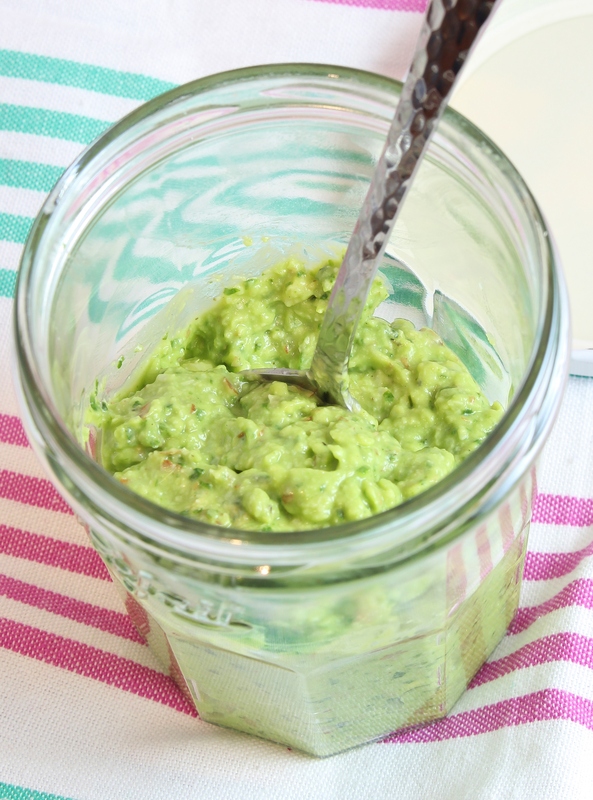 Place avocado flesh, lime juice and coriander in a small food processor and pulse until smooth. Add salt and pepper to taste. Place a medium saucepan filled halfway with water over a high heat and bring to the boil. Add a tablespoon of white vinegar (or lemon juice) to the water and let it remain at the boil. Assemble your bowls before you cook your poached eggs. Place half the baby spinach in each bowl. Divide roasted sweet potatoes between the bowls and top with a serving of lentils. Drizzle over avocado sauce. To poach your eggs. Crack the egg into a tea cup. Create a whirlpool in the water and slide the egg into the centre. The whirlpool should help to swirl the white around the yolk. You can use a slotted spoon to assist once the egg has started cooking a little. Cook for 3 minutes then remove immediately with a slotted spoon and perch atop your layered bowls. Devour immediately. 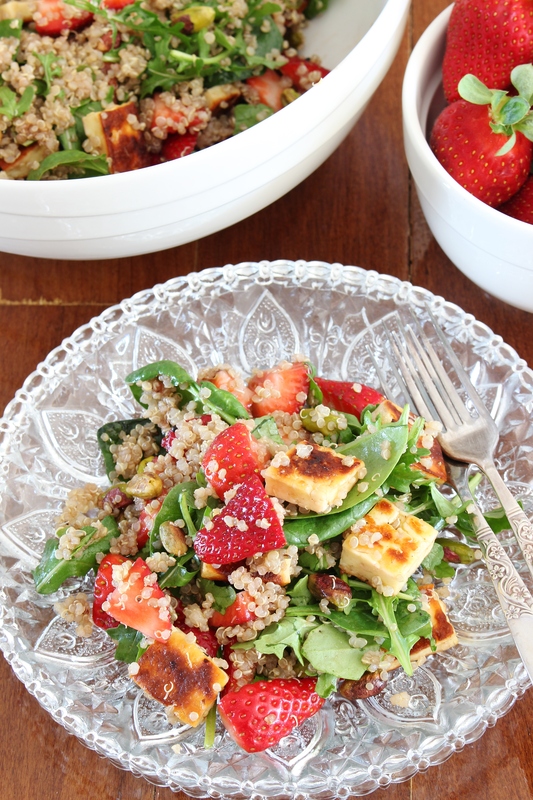 Bright sweet strawberries contrast salty pan-fried haloumi, crunchy peppery rocket, and creamy pistachios in this hearty but light vegetarian, gluten free salad. Yesterday was People’s Day and the Brisbane EKKA Show Holiday (for non-Aussies, that’s the agricultural show that comes to our city – we get a day off!) and I was happy to fill my day with bright shiny things that did not include battling crowds to buy showbags, stare longingly at the famous strawberry ice creams, and feel exhausted by humanity at the end of the day after finally finding my car again. Instead, I started off with a run, made and photographed three new recipes, saw ‘The Man from U.N.C.L.E.’ with Mum, Jess and Chris, updated my profile photos, and watched an interesting documentary. Now that’s my kind of day off. As we lay in bed last night, drifting off to sleep, I felt like we had distilled the weekend into a perfect 24 hours. I think I could get used to a midweek-weekend every week of the year! This luscious power house salad was one of the recipes I worked on yesterday. I was so tempted to eat the whole bowl as soon as I had photographed it – and it wasn’t even 10am yet! Every part of this salad is a talented and tasty ingredient on its own. Together they are showstopping. 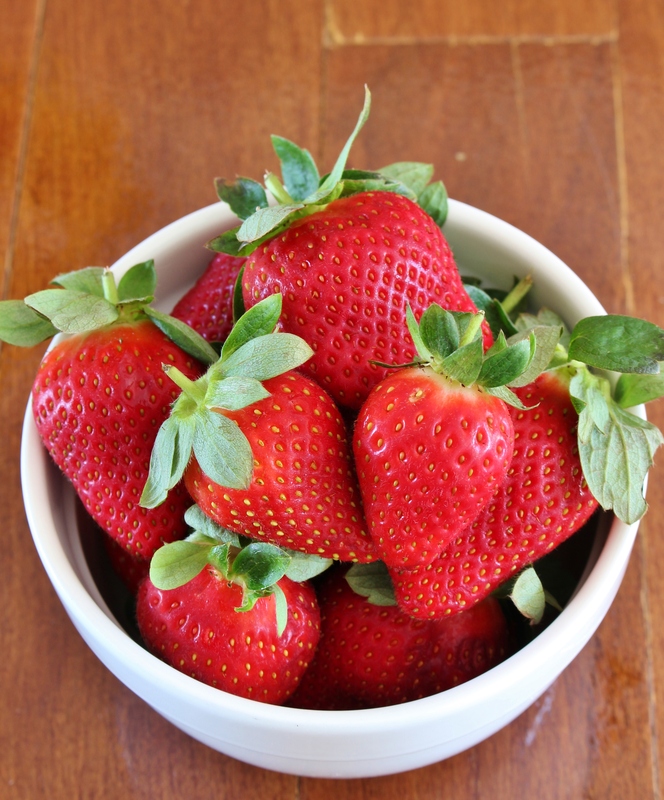 Sweet, plump winter strawberries are the first starring ingredient. I am enchanted by our strawberries at the moment. We are at the height of winter berry season and the strawberries are sweet deep rubies on sale in large quantities wherever you turn. I’ve never put strawberries into a savoury application before, but I loved these cherries in my salad earlier in the year, and after cramming a few kilos straight into my mouth I wanted to celebrate these strawberries in their very own salad. 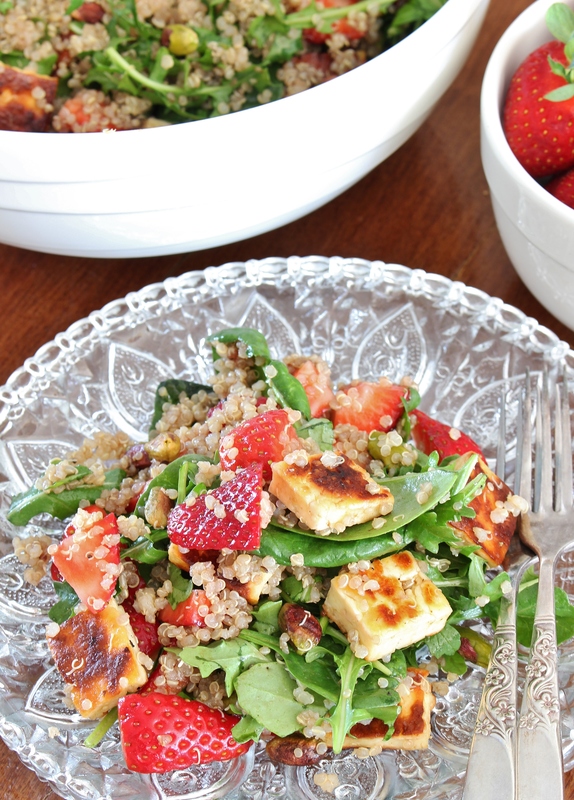 Sweet strawberries are complemented by salty grilled haloumi in the best way possible. Every sweet bite is met by a partnering step of salty, umami in a dance that dazzles tastebuds – it’s this combination that had me running back to the kitchen for seconds last night! Peppery rocket is a great background and quinoa keeps this salad hearty. 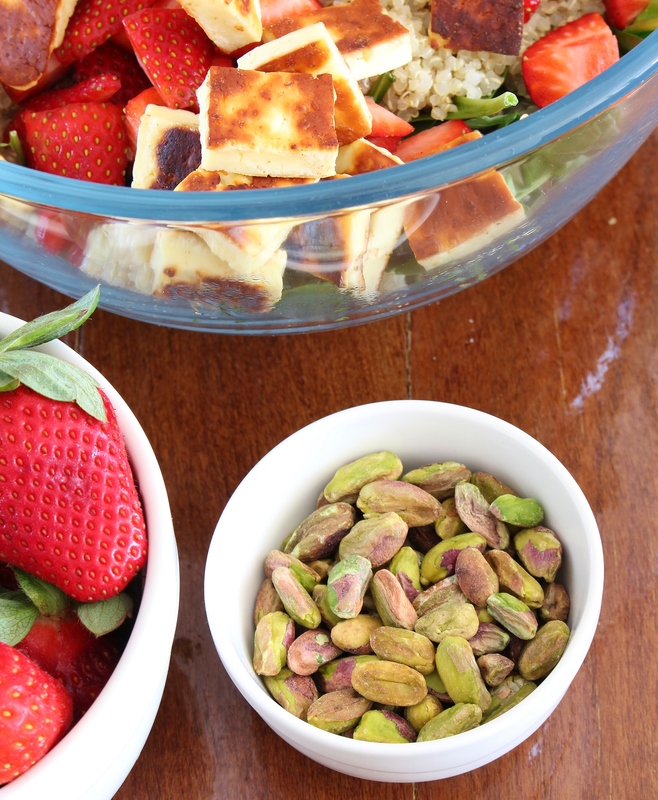 The finishing touch: sweet and creamy pistachios, which provide the perfect occasional crunch and surprisingly hold their own against the bold strawberries and haloumi. To tie all of these together I’ve tweaked one of my favourite vinagrettes: based on balsamic vinegar and sweetened with just a touch of strawberry jam! Trust me, it works deliciously! 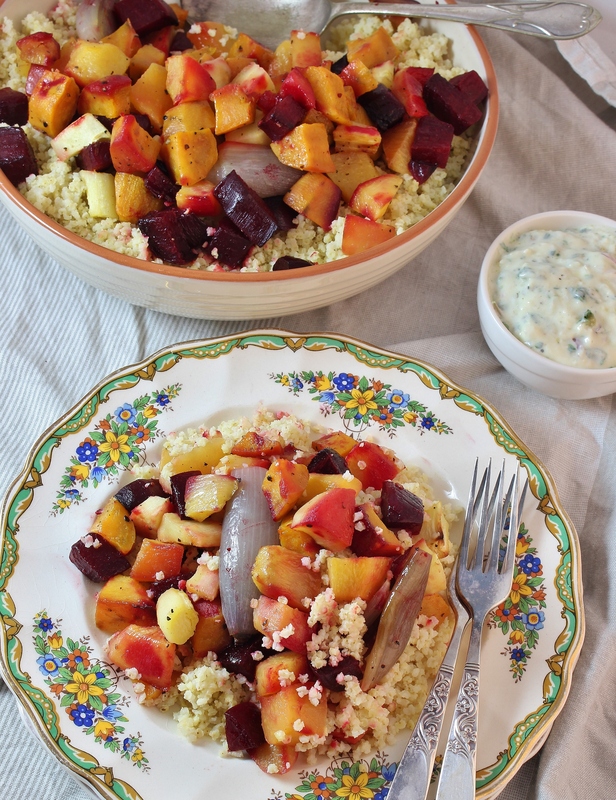 I’m not going to wait for our next public holiday to make another big batch of this moreish salad! 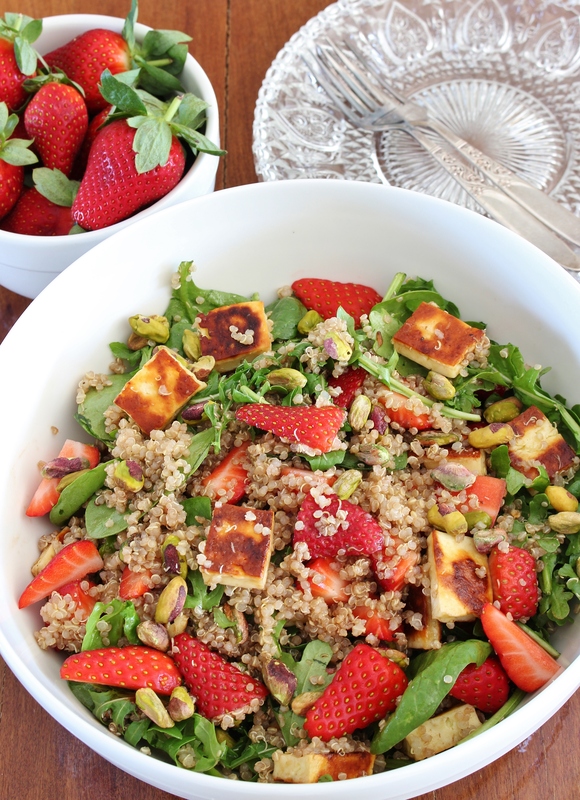 I might not be able to have a four day week every week, but I can conjure up my own sunshine by filling my lunchbox with delicious Strawberry, Haloumi, and Quinoa Salad. Gluten Free | Vegetarian | Serves 3 as a light meal | Leftovers can be stored in an airtight container in the refrigerator up to three days. Note: I used white quinoa, but you can use whatever colour you have on hand. 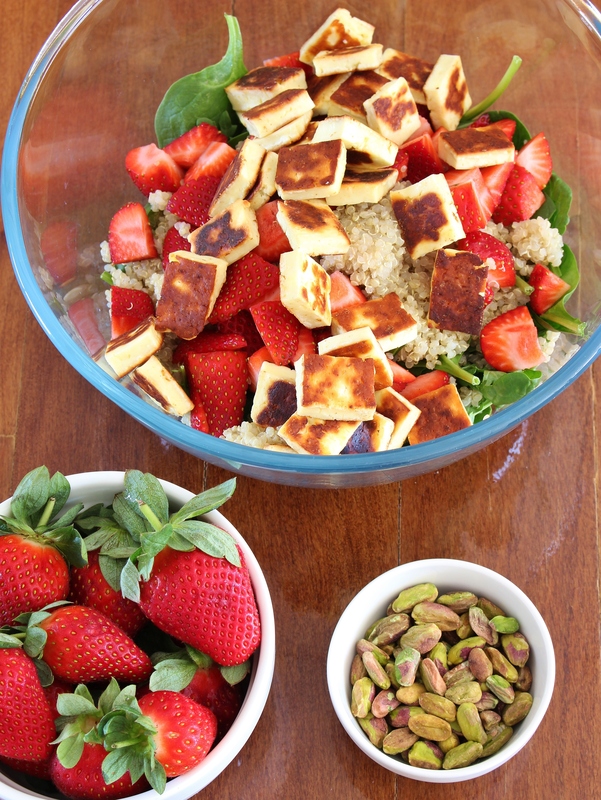 While quinoa is cooling, dice haloumi into small cubes. Heat a non-stick frying pan over a medium heat. Fry haloumi until golden. Remove from heat and cool to room temperature while you make the dressing. To make dressing: whisk together balsamic vinegar, strawberry jam, olive oil, salt and pepper until smooth. Place rocket leaves in a large bowl. 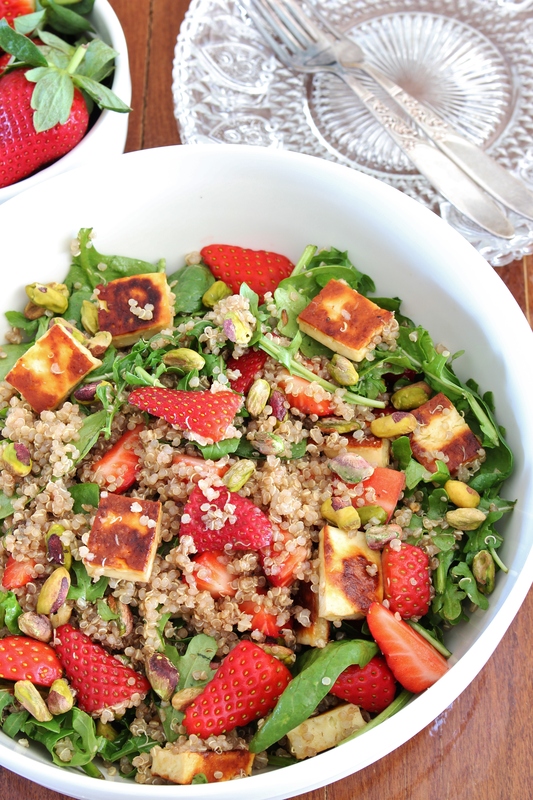 Add quinoa, strawberries, pistachios, and fried haloumi. Pour dressing over and toss gently but thoroughly until all ingredients are mixed and coated with dressing. 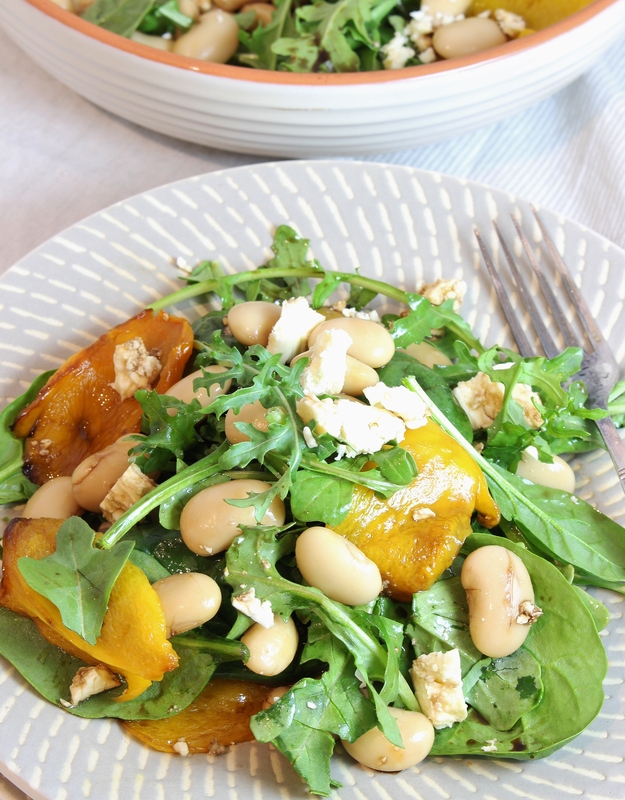 A simple bright salad that will add a burst of flavour to your meal whatever you are serving up! Take a big dish of this on your next summer picnic, or serve it next to your roasted veggies in the middle of winter. Whatever the occasion this Simple Roasted Capsicum, Butter Bean, and Feta Salad is the perfect side dish. I love complex, multi-layered salads that are meals unto themselves, but sometimes a simple but powerfully flavourful side salad is exactly what you need. When you are using only a few ingredients you want to make sure that you choose the best quality produce and let each ingredient shine by highlighting its best incarnation. 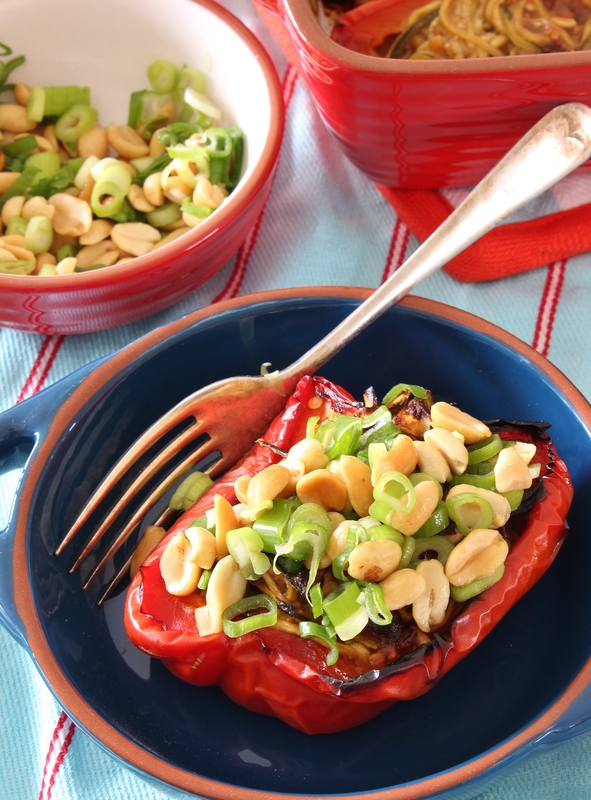 For capsicum, that means roasting them until they are soft, slippery sweet pieces. 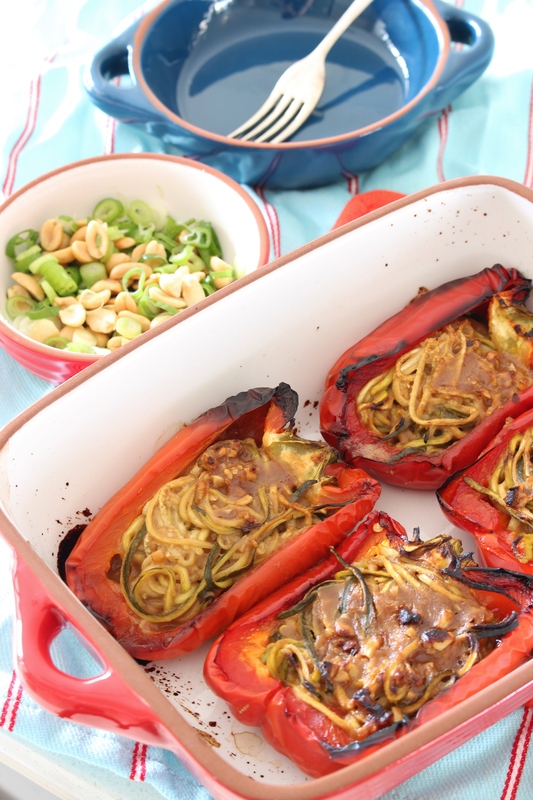 I love roasted capsicum, and golden capsicums are especially sweet after their time blistering in the oven. You could just as easily use red capsicum here if yellow is unavailable, but I wouldn’t substitute green as they are too young and grassy. Sweet roasted capsicums find their perfect pairing with salty Greek feta, peppery rocket, and a simple balsamic vinaigrette. 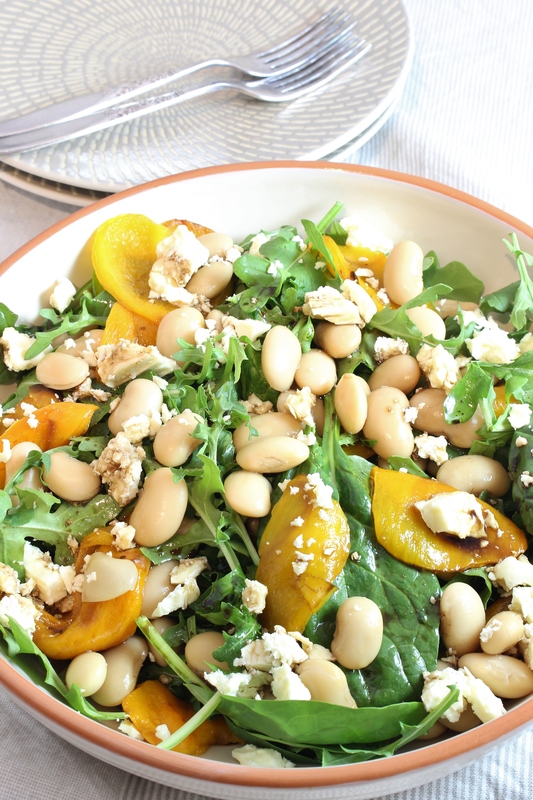 Butter beans are a mild but toothsome protein source and soak up the vinaigrette nicely. 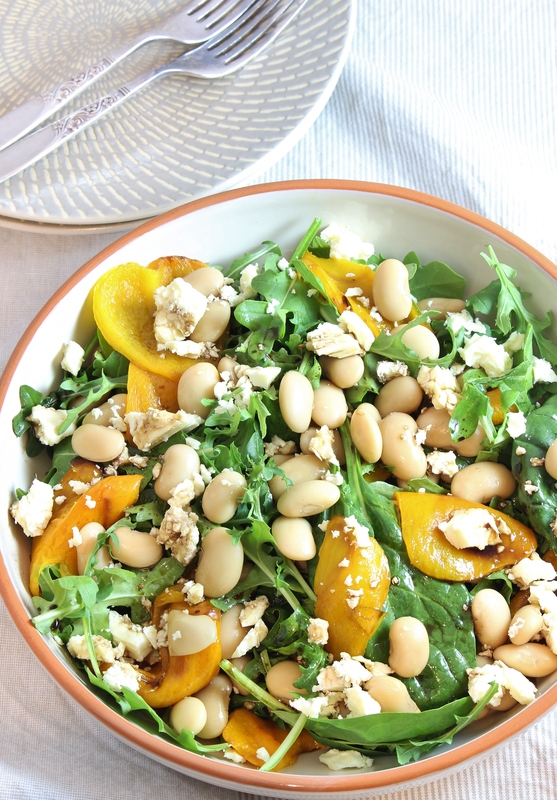 This salad is deceptively simple in ingredients, but the flavour is far from meek and mild. This is one stand out side dish. As someone with special dietary needs I often find myself making meals out of the side dishes available, so I take a little extra care when creating side dishes to serve to my friends because I don’t want them to be merely expected offerings, but tasty morsels in their own right. That doesn’t mean slaving over side dishes for hours – you just need to consider a few elements to create the perfect side salad. Choose the freshest greens available – try a mix of leaves if you want to boost the flavour even more. This mix here included both baby spinach and baby rocket. Have one super star ingredient and make it shine – roasted yellow capsicums in abundance anyone? Yes please! 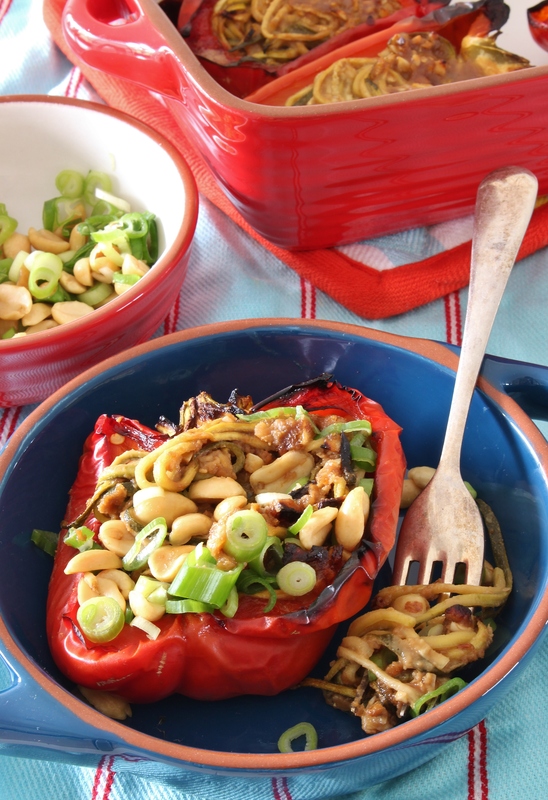 Sprinkle on something salty – feta, parmesan cheese, toasted nut or seeds – make it interesting and choose a few! 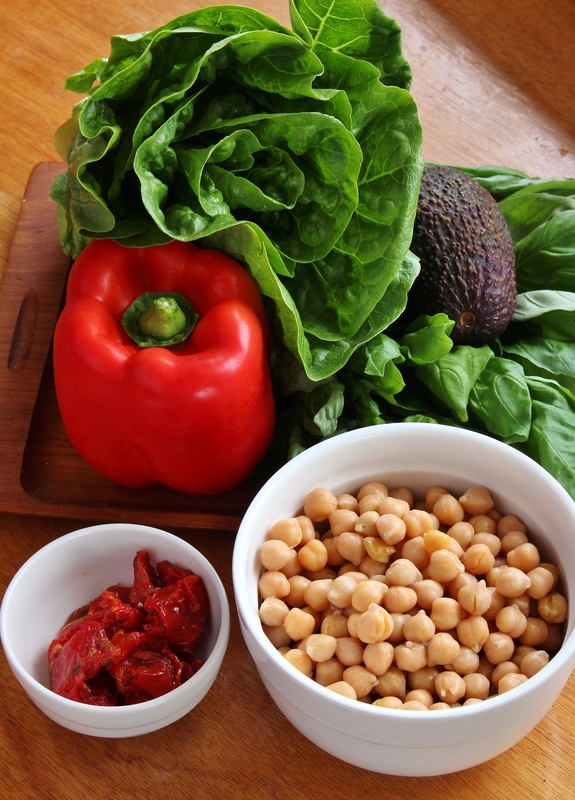 Add some protein to keep it hearty – butter beans, chickpeas, quinoa, maybe a few halved boiled eggs? Make your sides simple but substantial. I think this Simple Roasted Capsicum, Butter Bean and Feta Salad is my new favourite combination! What’s yours? Preheat your oven to 180C (350F) and place an oven shelf as close to the top broiler as possible. Line a baking sheet with aluminium foil and set aside. 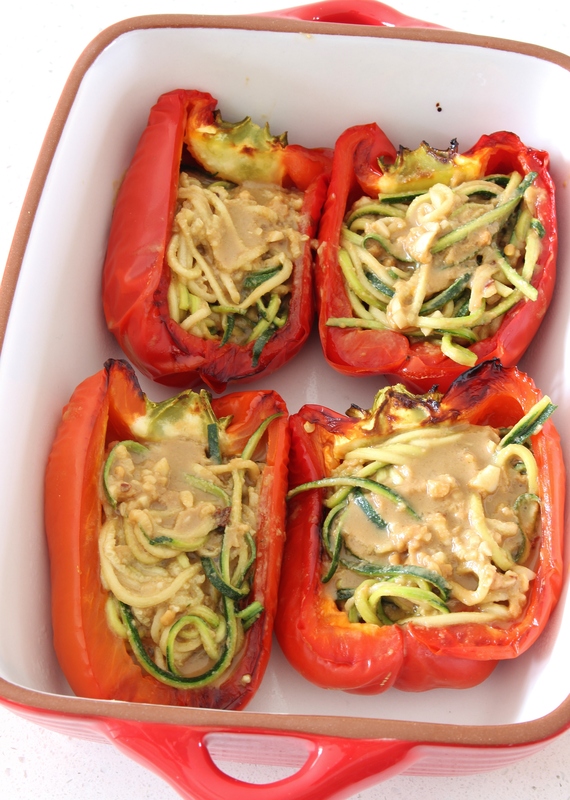 Cut capsicum into large pieces around the core and place skin side up on the baking sheet. Place sheet under the broiler until the skin is blackened and blistering. This should take about 15 minutes. 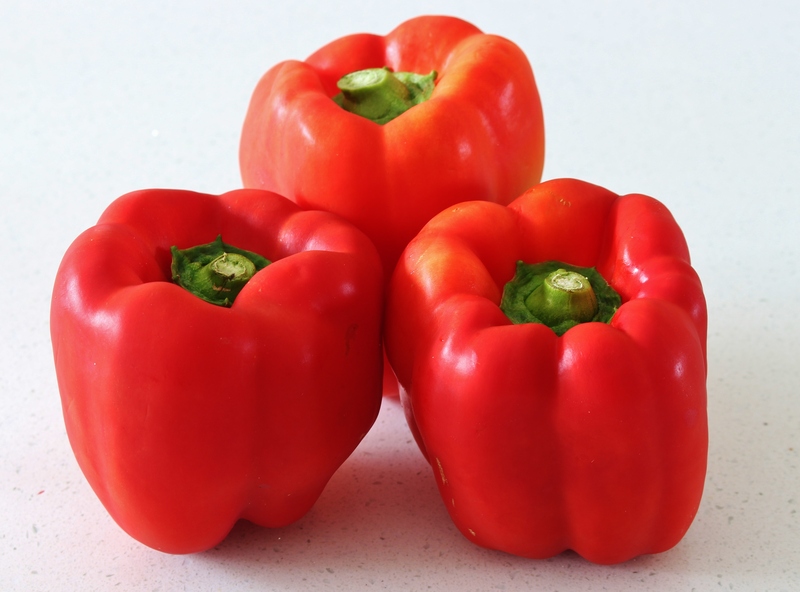 Remove from the oven and place capsicum into a container with the lid only loosely on. Allow capsicum to cool. Once capsicum is cooled peel blackened skin off and cut into capsicum flesh into large strips. 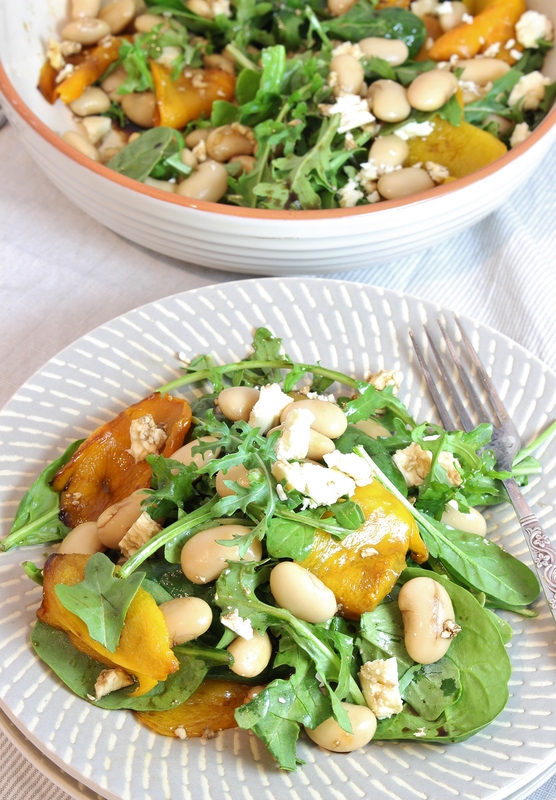 In a large salad bowl toss together butter beans, rocket, and capsicum strips. Crumble feta over the salad. Whisk together olive oil, vinegar, oregano, and salt and pepper to taste. Pour vinaigrette over the salad and serve. 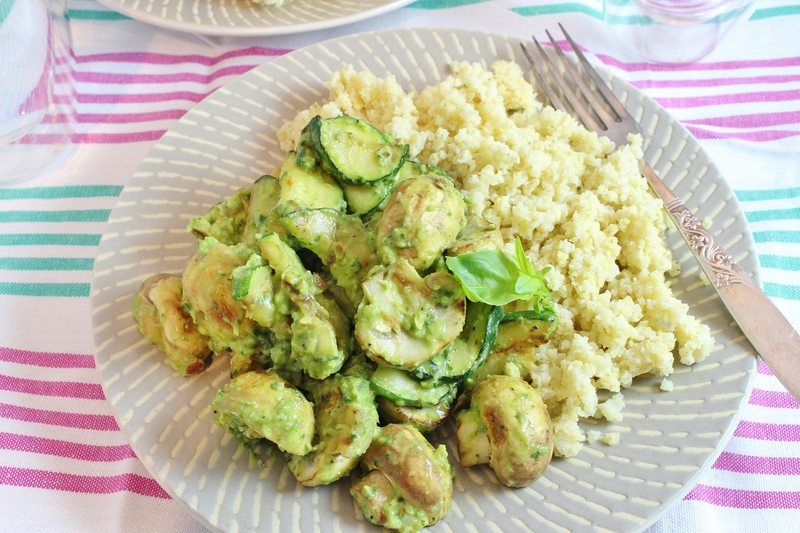 Grilled mushrooms and zucchini are tossed in bright basil pesto with an avocado twist and served over buttery millet in this light but substantial gluten free, vegetarian dinner that is sure to become a weeknight favourite. When you are surrounded by piles of unshelved books and mountains of unpacked boxes it’s tempting to ‘just have something quick’ so that you can get on with the insurmountable ‘to do’ list, and forget about sitting down to a real meal. The same thing happens on busy weeks when you aren’t moving house. But in those busy moments, when it is so easy to forget about treating our bodies well, we should take a deep breath and a few moments to focus on thoroughly nourishing ourselves. Half an hour of self care can recharge your batteries and give you the energy to face down that ‘to do’ list and defeat it. That was my story last night. Instead of opting for the quick option (cheese, avocado and rice crackers) I took an hour (including 30 minutes to fuss about with photos) to myself between gym time and unpacking time to make a real meal, the first in our new house, and then I powered through our walk in robe for the rest of the night. Now, let’s talk about what fuelled my fashion foray. First, let’s talk about this pesto. This stuff is dangerously easy to eat straight from the jar. Or spread on any available edible surface. Luckily I managed to control myself and most of it ended up in dinner. 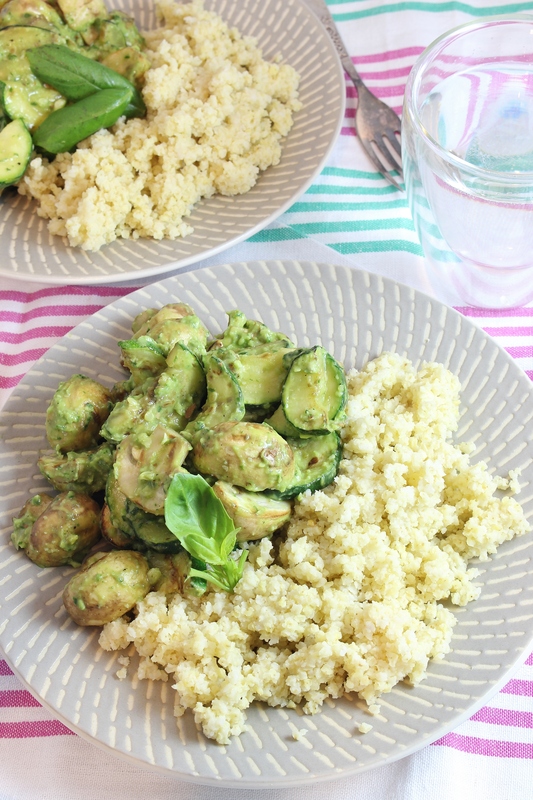 I love this avocado-spiked pesto so much. It’s creamy, and smooth but still has signature basil pesto flavour. And it’s super easy to make! In the bowl of a small food processor you just whiz together avocado, almonds, lemon juice, basil leaves, salt and pepper and then stir in finely grated parmesan right at the end. How easy is that! So many uses for this easy to prepare, bright and moreish condiment! In my midweek offering this week my amazing sauce coats hearty grilled button mushrooms and zucchini with a side of buttery millet. As soon as these photos were taken you can bet I mushed everything around so that even the millet was coated in creamy avocado and basil pesto. I just wanted to maximise the amount of pesto in my face. As soon as summer comes I am planting my own basil crop just so I can have this pesto on tap at all times! No more midweek dinner dilemmas! 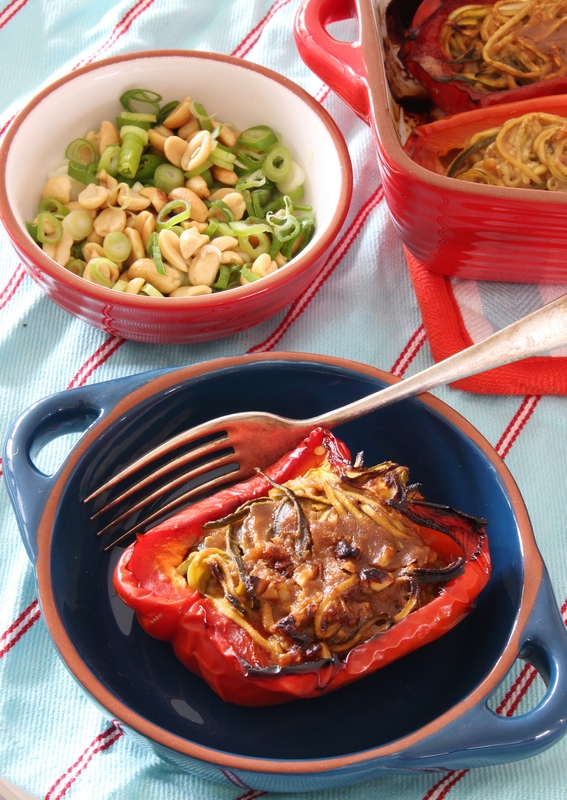 Veganise it: simply leave out the Parmesan cheese for a vegan dinner! For the omnivores: toss in some grilled chicken with your mushrooms! Rinse millet thoroughly in water and drain well. Place in a medium size saucepan with the vegetable stock and bring to the boil over a medium-high heat. When millet reaches boiling point, reduce heat to a simmer and cover the saucepan with a lid. Cook without stirring for 10 minutes or until the water is absorbed. Remove the millet from the heat and stand for 5 minutes before fluffing with a fork. 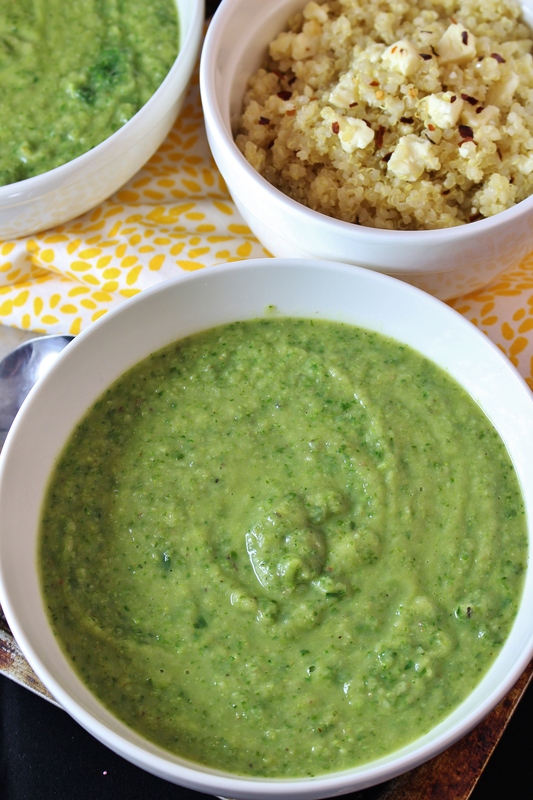 While the millet is boiling, make the pesto sauce. In the bowl of a small food processor combine avocado flesh, garlic, almonds, lemon juice, and basil leaves. Puree until smooth. The thickness should be similar to mayonnaise. Add 1-2 tablespoons of water if required. Stir in grated parmesan, and season with salt and black pepper to taste. On a medium non-stick grill pan (or non-stick frying pan) saute mushrooms and zucchini until cooked but still firm. This should take about 5 minutes. Stir frequently. Once the vegetables are cooked toss the pesto through the vegetables. 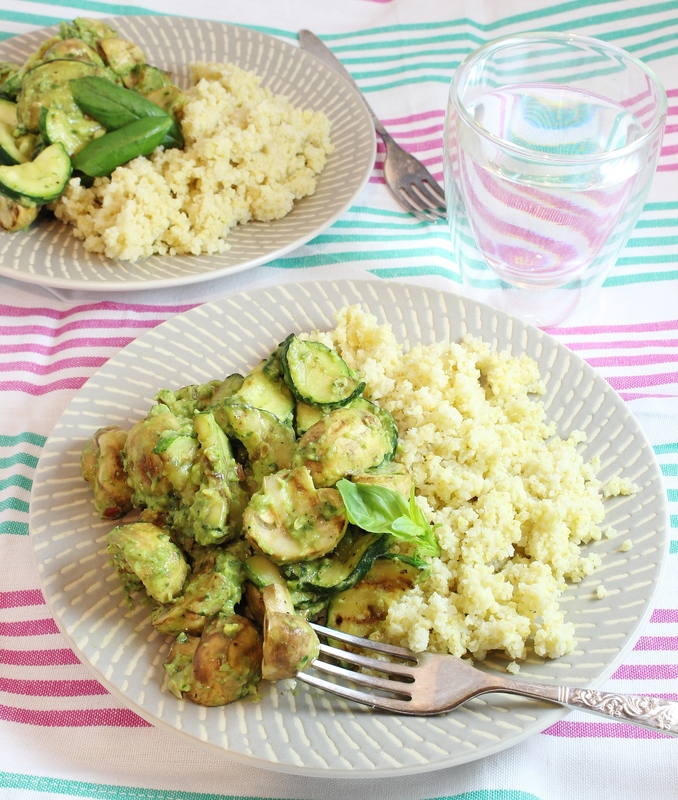 Divide millet between plates and top with pesto coated vegetables. Enjoy! A bright midwinter vegetarian soup filled with gnarly root vegetables, fresh greens, and herbs, and topped with a simple spicy quinoa garnish. This soup makes the most of deep winter greens and hardy winter vegetables. I’m a greens-loving girl. I love big bowls of crunchy freshness, smoothies packed with spinach, and I’ve been known to snack on broccoli stems while making dinner. (It’s okay Mum I’m still eating cookies too.) In the middle of a biting winter night though, there is nothing more soothing than a big bowl of thick, flavoursome soup and this one comes packed with the goodness of greens too! Celeriac is the ugly duckling of the vegetable world. It looks nubbly and knotted and really rather ugly. But just like that aesthetically challenged duck, when celeriac comes into its own it brings a singular beauty to the world, or your dinner table in this case. Celeriac tastes like the halfway point between celery and potato. Creamy, with a bit of a bite. You can roast it, mash it, or you can make delicious and hearty Celeriac, Parsnip, and Greens Soup with it. 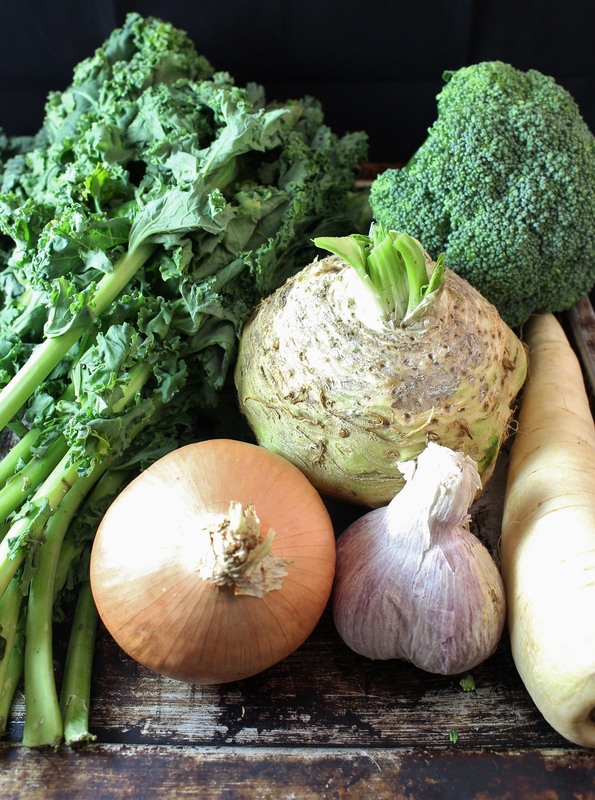 Celeriac is joined by the ultimate greens: kale and broccoli. Say hello to a boost of iron, vitamins A, C, and E, folate, and calcium! Bye bye winter colds! This soup is so easy. I made it on a Monday night and enjoyed a boost of greens at lunchtime all week long. While you are sipping on a hard-earned cup of tea and massaging high-heel tortured feet (or sipping diet coke and wearing sweaty gym clothes like I was) you peel and chop a few parsnips, some onion, a large celeriac and a few cloves of garlic. Then pop the whole lot into some vegetable stock with a few large tablespoonfuls of herbs and let it bubble away while you relax for thirty minutes. Add some roughly chopped kale and a head of broccoli and you are just a puree away from hearty green heaven. This soup is made extra hearty and filling by the addition of a dollop of spicy quinoa. While the soup bubbled away I boiled up some quinoa, and then let it cool to room temperature before tossing through some flavoursome extra virgin olive oil, chilli flakes and crumbled feta cheese. 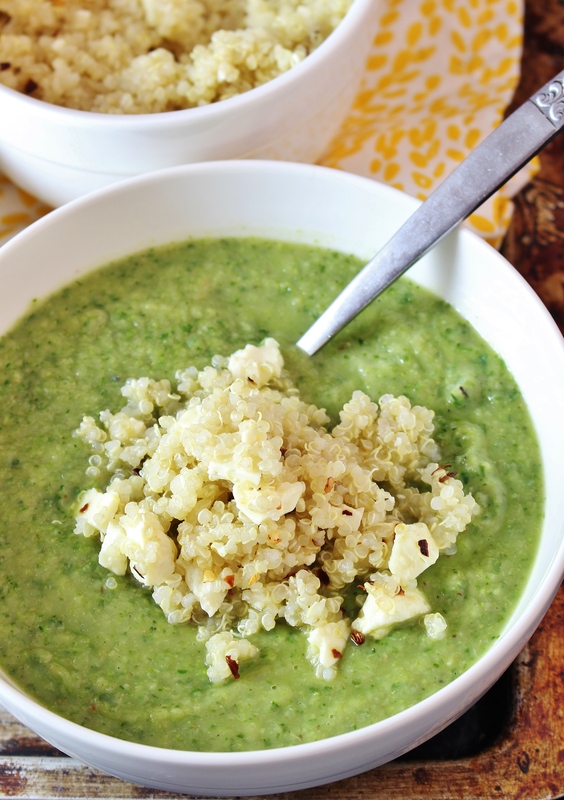 Every mouthful is a slurp of creamy, green, herby soup accompanied by the hearty chew of quinoa, salty feta, and a slight bite of chilli. Simple but perfect. Just what a midweek dinner should be. 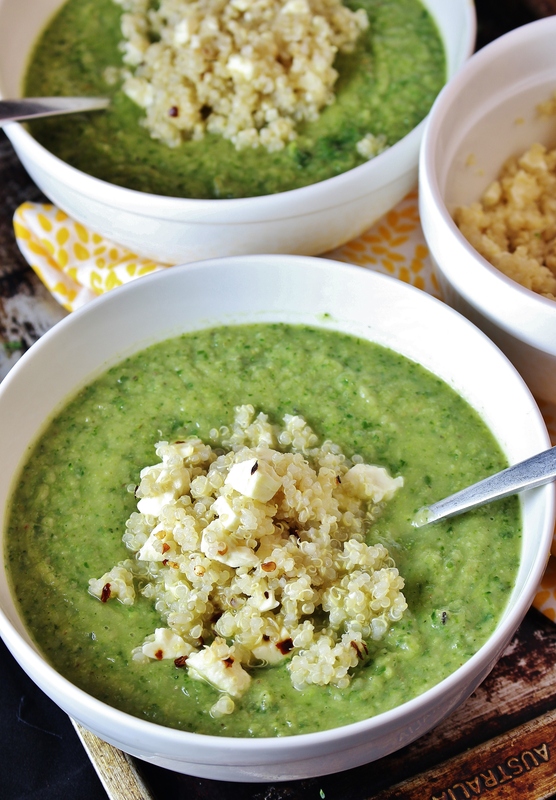 Serve up Celeriac, Parsnip, and Greens Soup with Quinoa, Feta and Chilli for dinner tonight! Leftovers can be stored in an airtight container in the refrigerator for up to three days or frozen for up to a month. Reheat on the stove over a gentle heat. Peel and dice onion into medium chunks. Heat olive oil in a large sauce pan over medium heat and add onion. Sauté until tender. Peel and crush cloves of garlic and add to onion. Peel and dice parsnips and celeriac into large chunks. Add to pot and sauté a few minutes until the edges of the vegetables begin to soften. Add dried herbs and pepper and stir to coat vegetables in herbs. Add vegetable stock and bring to a boil. Once the pot is boiling, reduce the heat to very low and cover the pot with a lid. Simmer for thirty minutes or until vegetables are very soft. While soup is cooking prepare the quinoa. Place rinsed quinoa into a medium sauce pan and bring to the boil. Once the water is boiling cover the pot with a tight fitting lid and reduce heat to a simmer. Cook for 15 minutes without stirring then remove from the heat and stand for five minutes. Then stir in salt, pepper, and extra virgin olive oil. Allow to sit until serving. Once the soup has been cooking for thirty minutes roughly chop the kale and broccoli (including stem) and add to the pot. Cook for a further ten minutes then remove from the heat. Use an immersion blender to blend soup until smooth. Place over a low heat to keep warm. 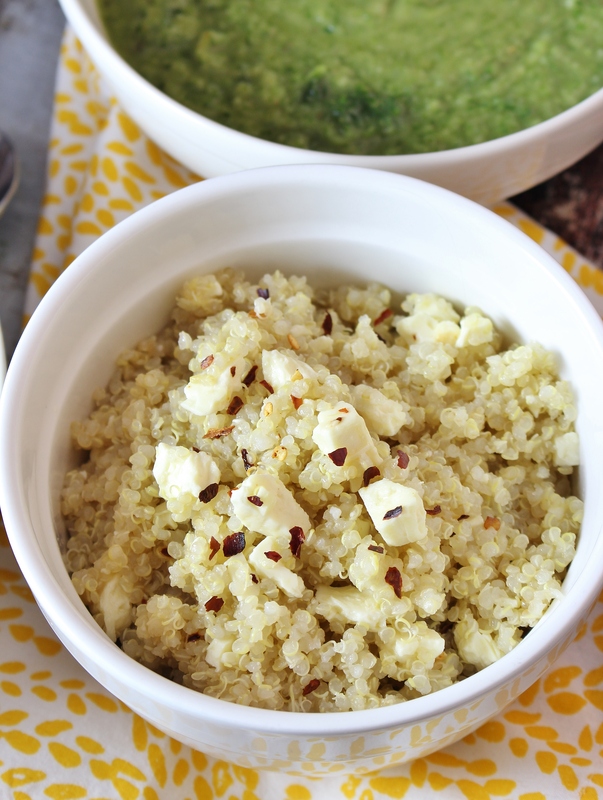 Stir crumbled feta into quinoa. Ladle soup into bowls and top with quinoa mixture. 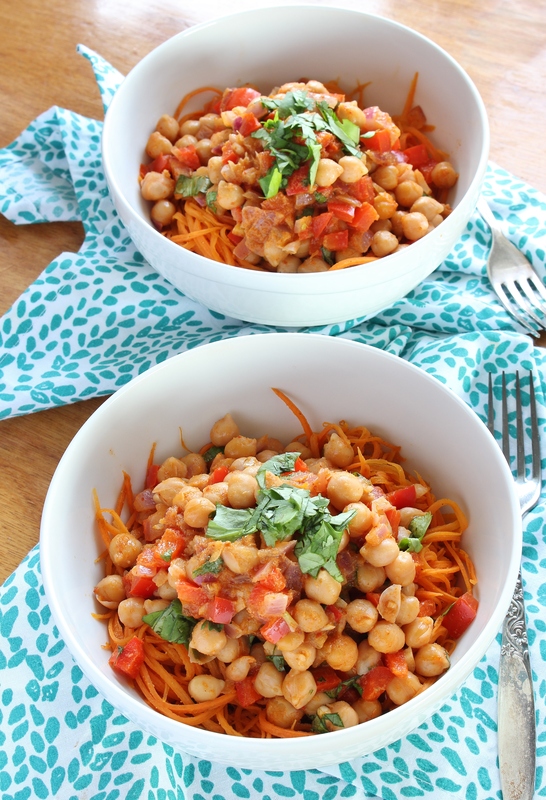 Spicy chickpeas in creamy red curry and coconut sauce top healthy sweet potato noodles for an easy, healthy dinner that’s ready in less time than it takes to wait for delivery! Put down that takeaway menu! Let’s make a healthy dinner to start the week. This dinner is filled with classic Thai food flavours updated with a healthy nourished life twist. You can have all those savoury, spicy, sweet flavours you crave in this lighter, updated version of red curry with noodles. I love Thai flavours. There are so many layers of spices, herbs, and fresh ingredients that come together to create truly crave-worthy food. Eating Thai food at a restaurant can be challenging for people who need to eat gluten free though because you are never quite sure of what sauces the kitchen is using, although I am lucky that Chris and I have found one or two spots near us that are gluten-free aware. And, let’s face it, eating Thai food at a restaurant also means I am going to order a big dish of white rice (yes, sir, that is all just for me) and perhaps an adult beverage or two. Not really the vibe I want to start my Monday night with. And takeaway food always comes in way too big containers that are somehow mysteriously empty by the time I’ve finished an episode of True Detective… Most of the time, for the sake of our health, wallet, and my skinny jeans, I would rather cook at home. Our fridge is always loaded with fresh vegetables and with a few other store cupboard ingredients you can whip up easy, healthy Thai inspired food at home in less time than it would take for the delivery man to find your house and for you to find PJs you are comfortable answering the door in. 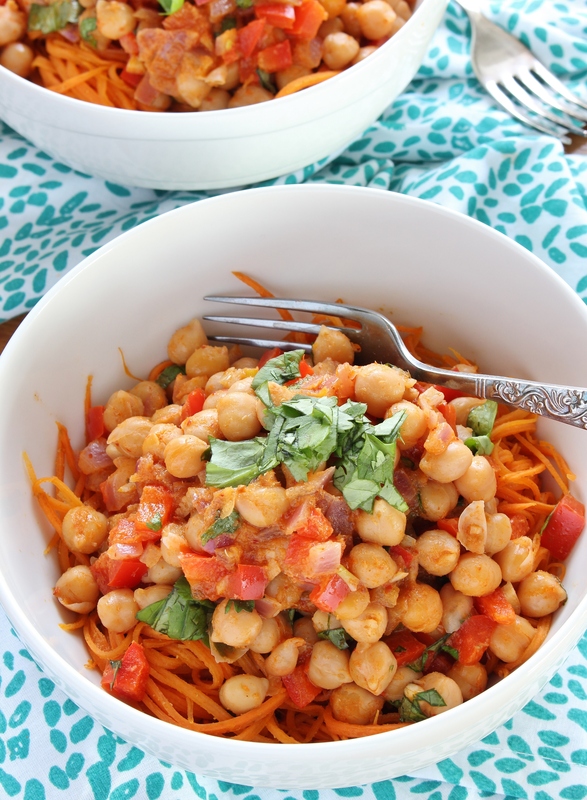 This red curry chickpea dish is ready in under twenty minutes! How’s that for fast food! The most important thing about making healthy food taste delicious is layering flavours. When your tastebuds are happy and satisfied you truly feel like you have eaten a meal, not some shadow of a dish with the label healthy slapped on it (I’m looking at you tasteless restaurant garden salad). In this dish we start with a flavour base of finely diced red onion, capsicum, and garlic. 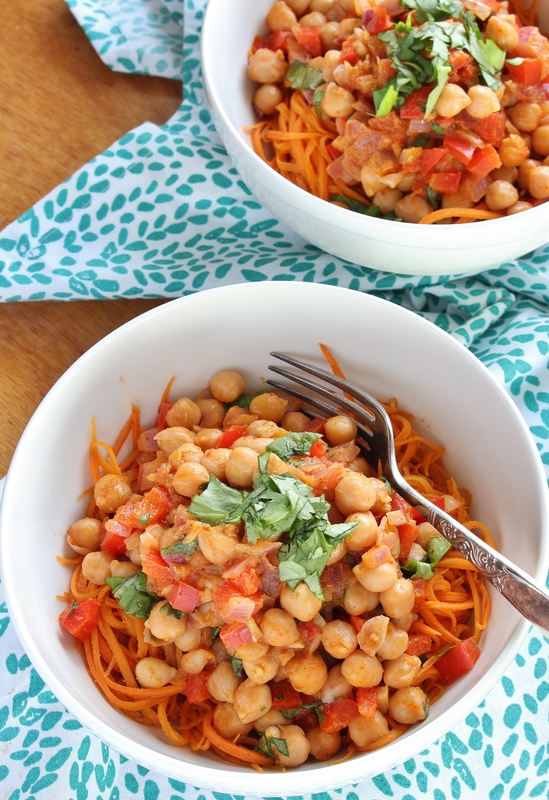 We add a healthy dose of red curry paste, canned chickpeas, light coconut milk, and a squeeze of lime. So many flavours that meld together! 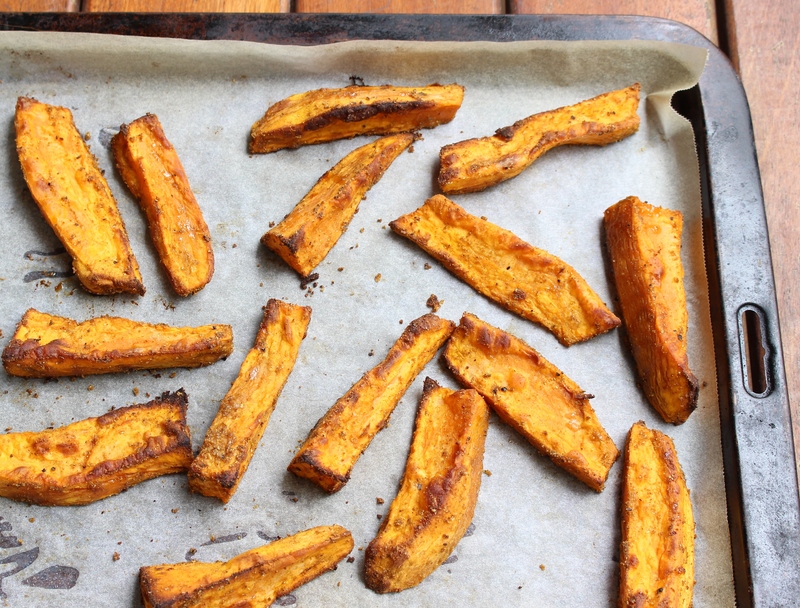 While our curry stays warm we shred some sweet potatoes with a julienne peeler (you could use a fancy spiralizer or a mandoline slicer instead) then quickly fry them off with cumin and a few chilli flakes for extra heat! With the scent of red curry and coconut mixed with fresh, floral coriander leaves you will feel like you have been transported to your favourite Thai spot. But here, you can wear PJs and watch Game of Thrones in bed. You know, like some of us do…. Note about heat: adjust the amount of red curry paste used for less heat if you are sensitive, or if you are serving this to kids. You can also leave out the chili flakes from the noodles to reduce the heat. Note about meat: For my omnivorous friends, this also works well with chicken breast. Your cooking time may be a little longer as you need to ensure the chicken is cooked all the way through. I recommend dicing into 2cm cubes if using chicken. Peel and finely chop onion and finely dice capsicum. Heat 1/2 tablespoon olive oil in a medium non-stick frying pan over medium heat. Add onion, capsicum, and garlic and fry until onion is translucent. Add red curry paste and cook for 1-2 minutes stirring. Add chickpeas and stir to coat completely in curry paste. Pour in coconut milk and stir to combine. Reduce to heat to it’s lowest setting and allow to simmer. Peel sweet potato and shred into long thin strips using a julienne peeler. Heat remaining olive oil in a small frying pan. Add shredded sweet potato, cumin and chili flakes and cook, stirring until sweet potato is softened. 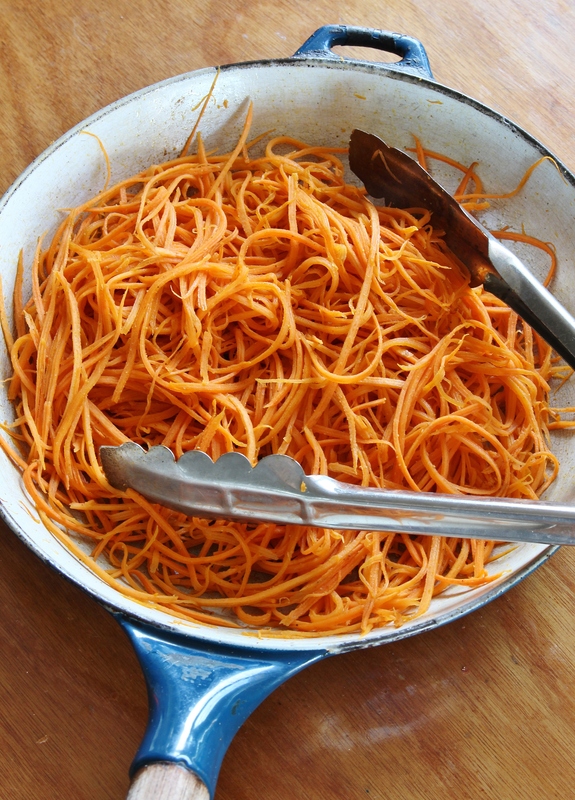 Place sweet potato noodles into bowls. Stir lime juice into chickpea mixture and then divide between bowls. 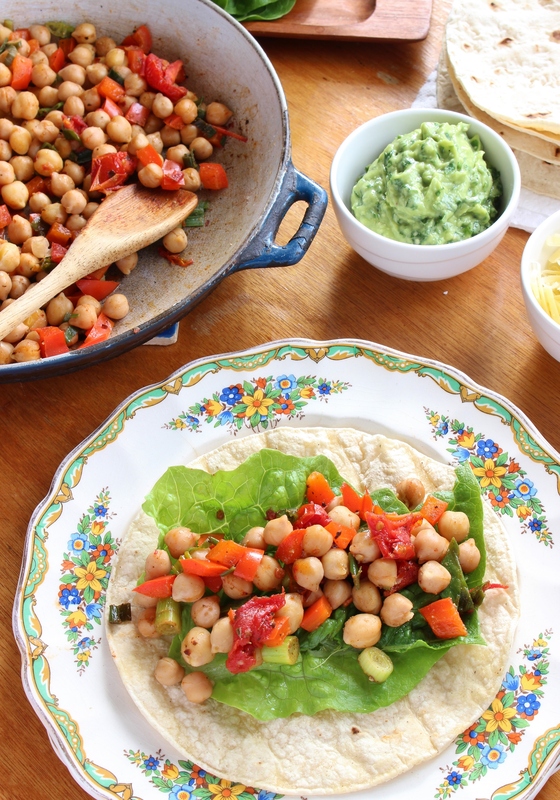 Spicing up weekday meals is easy with these Spicy Chickpea Tacos. Filled with chickpeas, sundried tomatoes, capsicum and onion and finished with a lime and coriander spiked guacamole, these prove that everyday food can be super special too. Our house is filled with half-stuffed boxes, Mum and Dad have more boxes ready for me at their house, I have lists upon lists in every conceivable place, and our keys are probably being cut right this moment! That’s right! We are almost on the move! Thank you all so much for listening to me get excited about the events of the next few weeks for the last eighteen months. Thank you for coming along for the ride, and all the encouragement you have given us along the way. There is always a spare seat at the table. Of course, getting prepared to move – and filling in all the paper work – no one warned me about all the paperwork! And having marathon meeting days at the office leaves very little time for thinking about dinner. 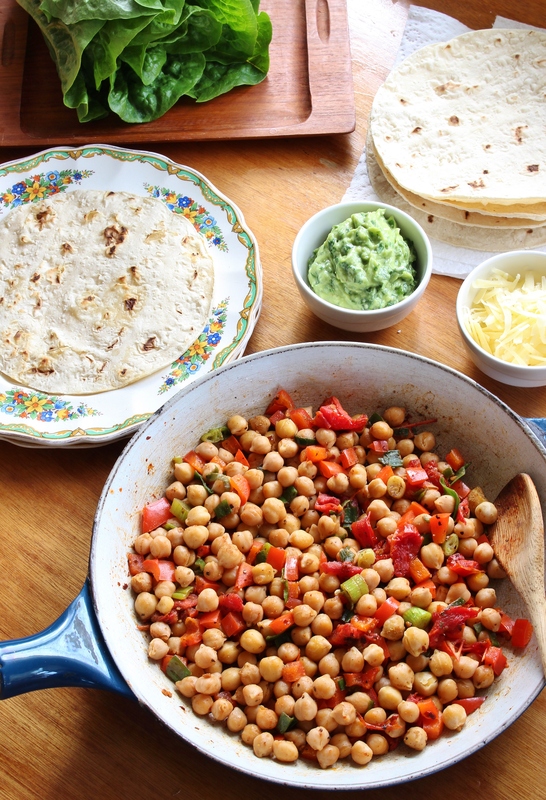 I am happy with salad most nights when I have been busy, but there are nights when I want my leaves wrapped in a corn taco, my chickpeas seasoned heavily with spices, and a big dollop of creamy, coriander and lime scented guacamole right on top. These tacos are essentially one of my favourite salads wrapped up in a gluten free corn taco for easy handheld convenience – no fork necessary, which is a good thing because I think they’re next on the packing list! 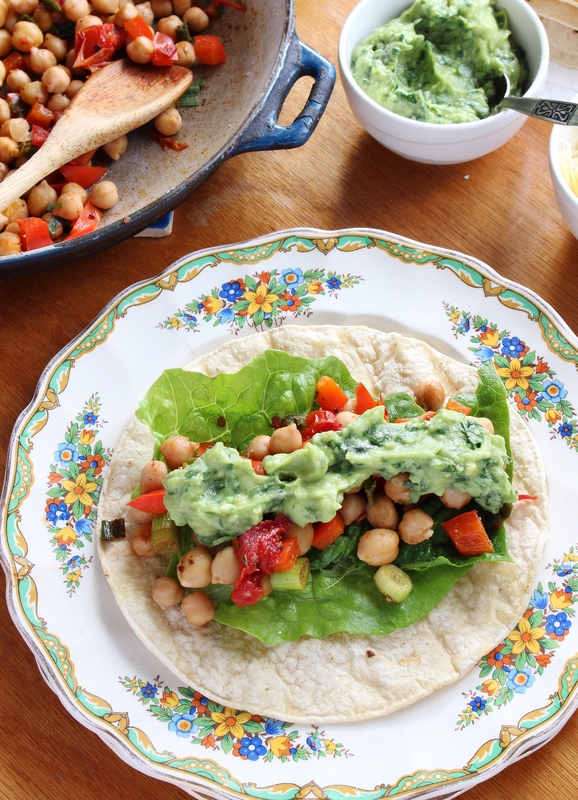 Not only are these tacos super easy to eat, they are a snap to prepare and super healthy! You can have these on the dinner table in under 30 minutes, which makes them perfect for quick weeknight meals. These gluten free, vegan tacos are packed with lean protein (chickpeas), heaps of veggies, and healthy fats (avocado) these are a healthy fast food option for when you want dinner on the pronto without sacrificing your healthy eating goals. 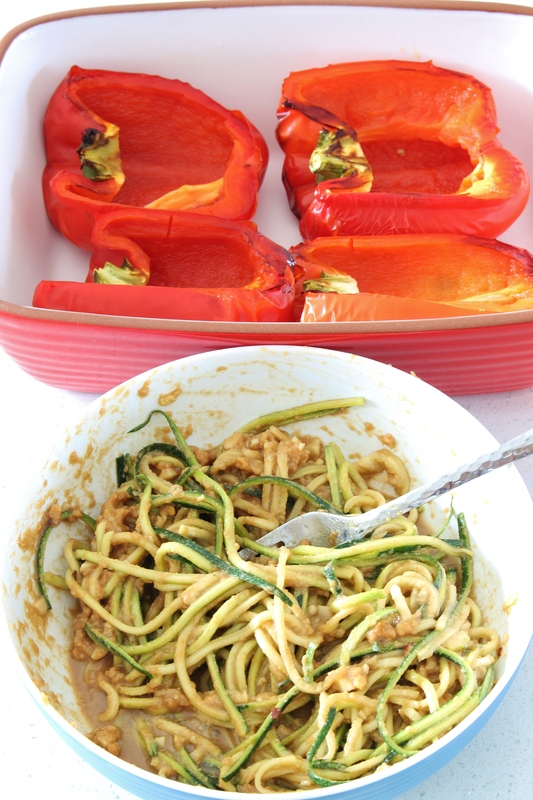 Let’s review: easy to eat, easy to make, packed with healthy ingredients. Oh and what about flavour? We start with a plain corn taco. Not much to see here, but a great foundation for layering our flavours onto. Add some fresh, crispy lettuce. I used baby cos – bright, green, and crunchy! 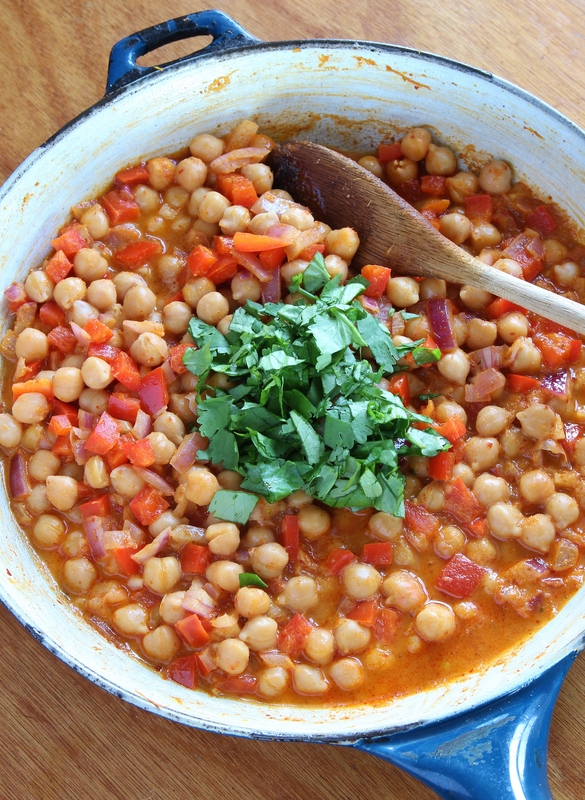 We sauté canned chickpeas with capsicum, spring onions, garlic, sundried tomatoes, chilli flakes, cumin, and paprika – this chickpea is filled with the best savoury and spicy flavours! And the crowning glory of this flavour creation: creamy avocados, whipped with garden fresh coriander and a squeeze of lime juice. These tacos might be simple, but they hit every flavour and texture note required for true satisfaction: crispy, creamy, salty, savoury, sweet. 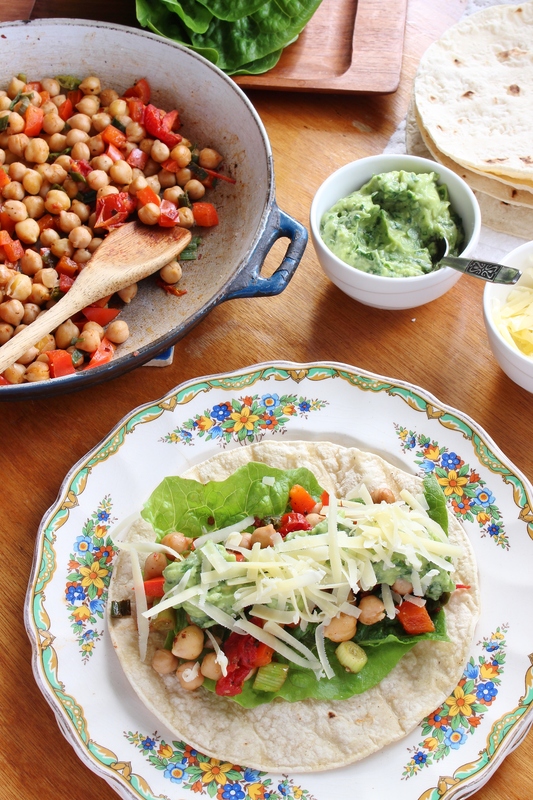 My Spicy Chickpea Tacos with Coriander Guacamole have it all! Note: I served mine with some grated cheese. If you are vegan, leave this out or use your favourite ‘cheese’ product. Heat olive oil in a medium frying pan over medium heat. Add capsicum and garlic and saute until capsicum is softened. Add chickpeas, spring onions, sundried tomatoes, paprika, cumin, and chilli flakes (if using). Cook, stirring, until chickpeas are warmed through. While chickpeas are cooking, make guacamole. Place avocado, coriander, lime juice, and onion into a small food processor and process until avocado is mostly smooth. I leave a few chunks for interesting texture. Salt and pepper to taste. 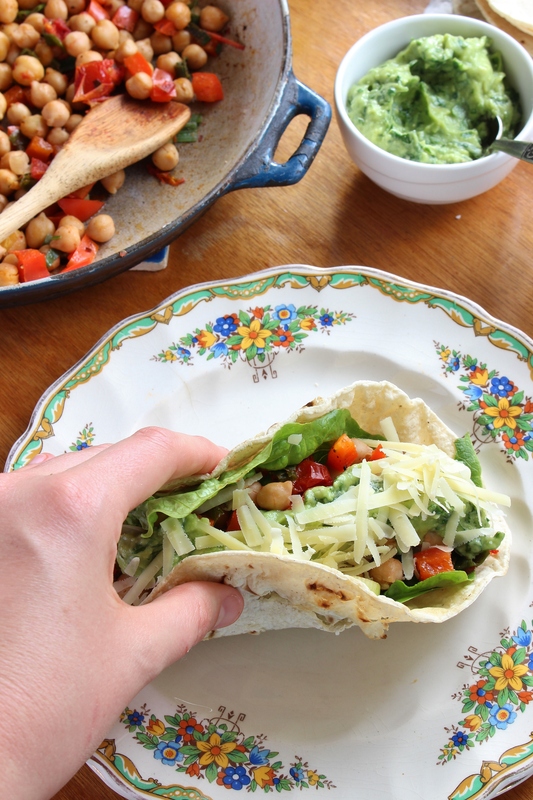 To serve, place a taco on your plate, top with lettuce, chickpea mixture, guacamole, and cheese (if using). So, dear reader, any smart packing tips? Any favourite taco flavours? 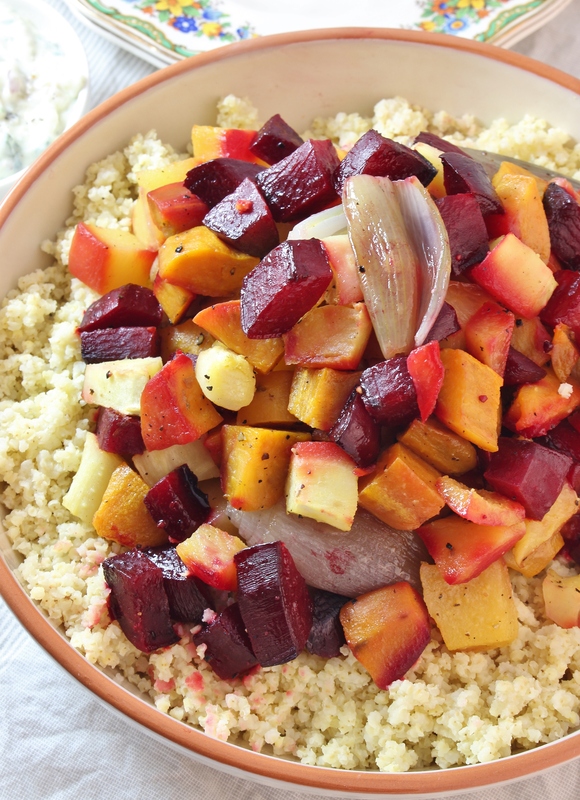 Get ready to roast all the winter root vegetables until they are sweet and soft then pile them on top of buttery millet and garnish with a yoghurt-based roasted garlic and marjoram dressing. This dish is comforting, super simple, and filled with good-for-you, fresh, seasonal ingredients. Sometimes on a Tuesday night on the way home from the gym you get a call from your little sister telling you that she is going to hospital because she has pains in her chest. Sometimes you feel powerless because there is nothing you can do so you need to go home and do something that keeps your hands busy because otherwise you will go crazy. So you go home and peel and chop and roast vegetables while eating roasted almonds and dark chocolate. Or so I hear. Note: she is now home and fine. Not a heart attack just a strained chest muscle. Phew. Not only are winter vegetables the best for keeping worried hands busy, they are exactly what my body is craving right now. 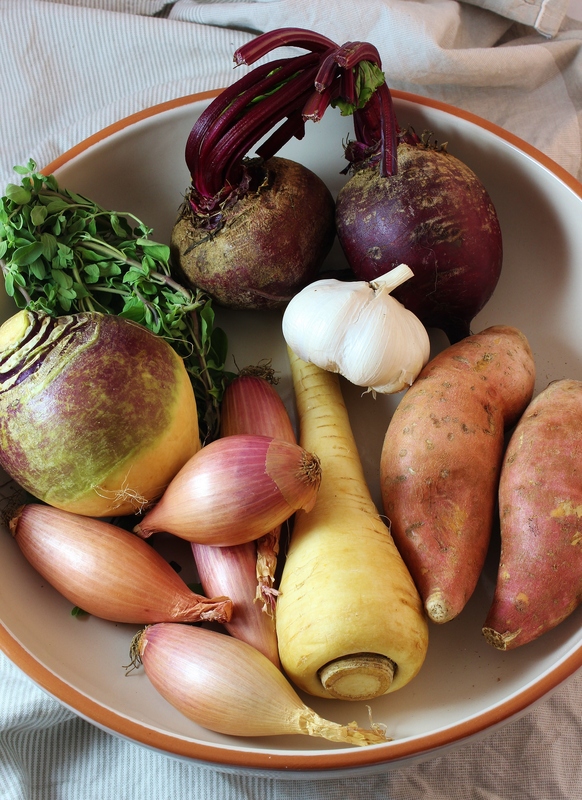 I love all the winter vegetables in their sweet, carbohydrate-storing glory – parsnips, beetroot, sweet potato, swedes, turnips – send me your root vegetables and I will love them. Winter vegetables are hardy, they grow in the rough, hard, cold ground to nourish us all winter long. And when you blast them with heat they will reward you with sweetness, straight from the earth. I used a mix of my favourite winter root vegetables in this dish, and you can replace the ones that you aren’t too fond of (I am aware that not everyone shares my love for swedes – the vegetable, not the people) with your favourites. The most important thing to remember when roasting a large amount of vegetables is to make sure that your pieces are all roughly the same size. This way they will cook in a similar amount of time and you won’t have crunchy beets and soggy sweet potatoes. Ick. These, mostly uniformly sized, chopped winter veggies were cooked through and soft, but not squishy, and the mix of vegetables provided contrasting flavours in each bite. See, even in the middle of winter variety abounds! I paired my roasted vegetable gems with millet. I love this ‘pseudo-grain’ (it’s really a seed) for it’s naturally buttery flavour, and how easy it is to prepare. Much like quinoa it goes into a pot on the stove, boils, simmers, sits and voila! Ready to serve in under 20 minutes! The yoghurt sauce was inspired by aioli. I love aioli, but I’ve never tacked it at home (yet…). I had some thick Greek yoghurt, some garlic, and marjoram in the fridge. Roasted garlic is my siren song, so into the oven it went where it turned from sharp edged fresh garlic to golden, molten roasted garlic heaven. Mmmm. 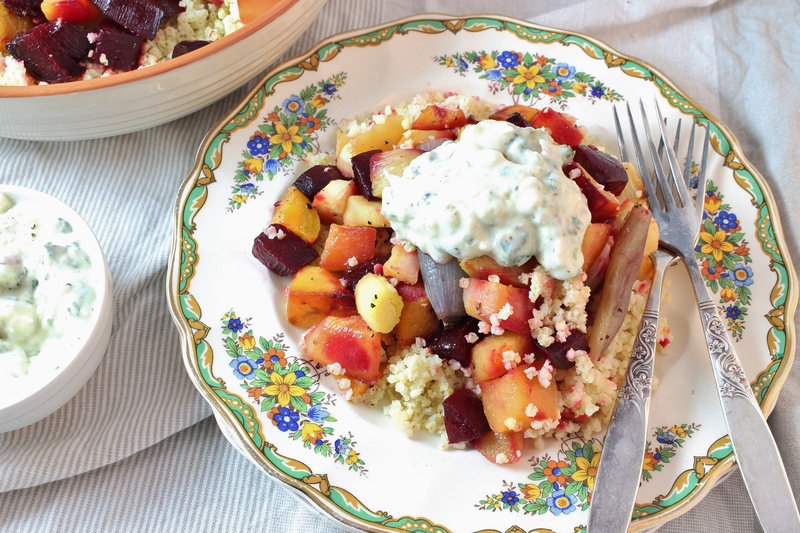 The plain sweet, roasted vegetables and buttery millet welcomed the herbed garlic yoghurt dressing perfectly. 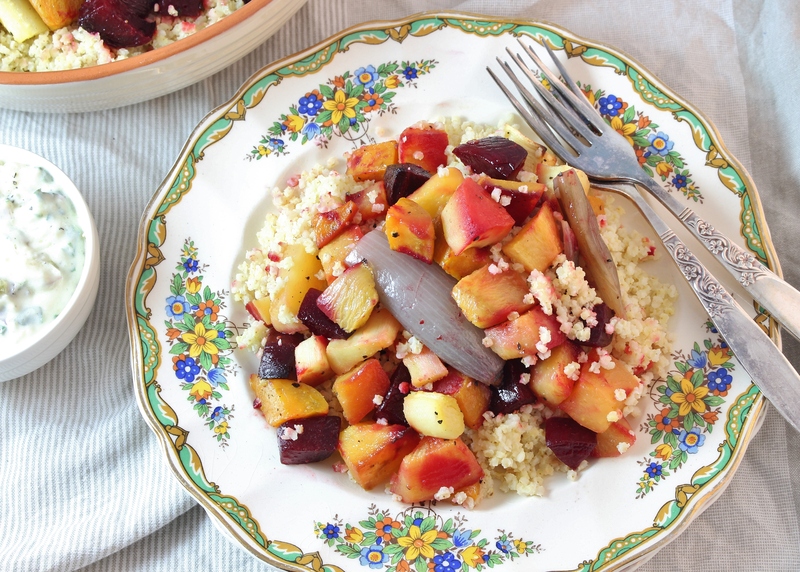 Gather your favourite winter vegetables and let’s make this tonight! Note: the vegetables listed below are what I used in my dish, but feel free to replace them with your favourite winter veggies! Preheat the oven to 200C (400F) and line a large rimmed baking sheet with baking paper. Peel and chop beetroot, swede, sweet potatoes, and parsnip into fairly uniformly sized pieces, just larger than a playing dice. Peel shallots and slice in half. Place chopped vegetables onto baking tray, toss with olive oil and season with salt and pepper. Wrap head of garlic in foil and place on tray too. Roast vegetables for 25-30 minutes or until soft in the centres. While vegetables are cooking, prepare the millet. Rinse millet thoroughly and then place in a medium sauce pan with vegetable stock. Place over high heat and bring to the boil. Once the millet is boiling, reduce the heat to a simmer, and place the lid on the sauce pan. Cook for 15 minutes without stirring. Remove from heat, allow it to rest for 5 minutes and then fluff with a fork. To make the dressing. Peel and quarter shallot. Place into a small food processor with marjoram and whizz until finely chopped. Squeeze heads of roasted garlic out and add to food processor. Whizz until combined. Add yoghurt, verjuice, and salt and pepper to taste and stir to combine. 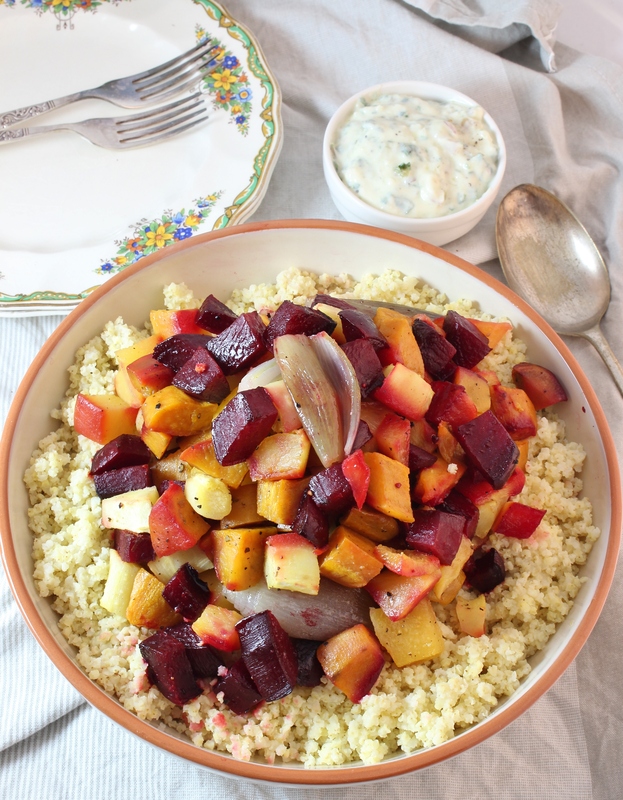 Divide millet between plates, top with vegetables, and garnish with yoghurt dressing.